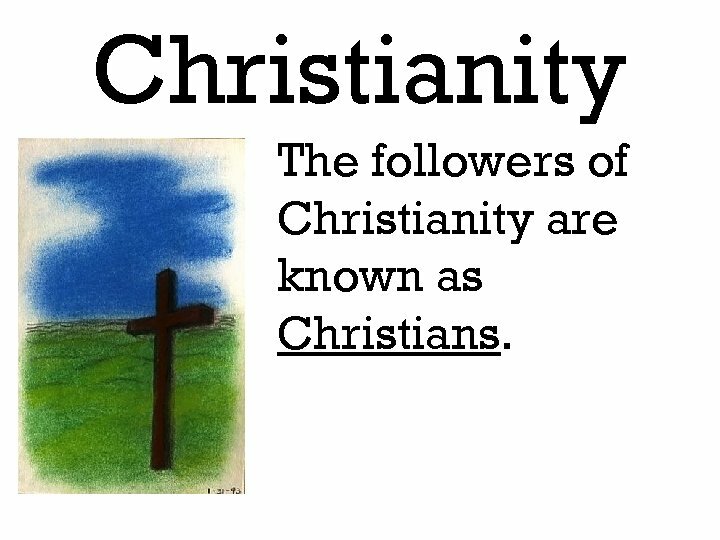 Christianity The followers of Christianity are known as Christians. 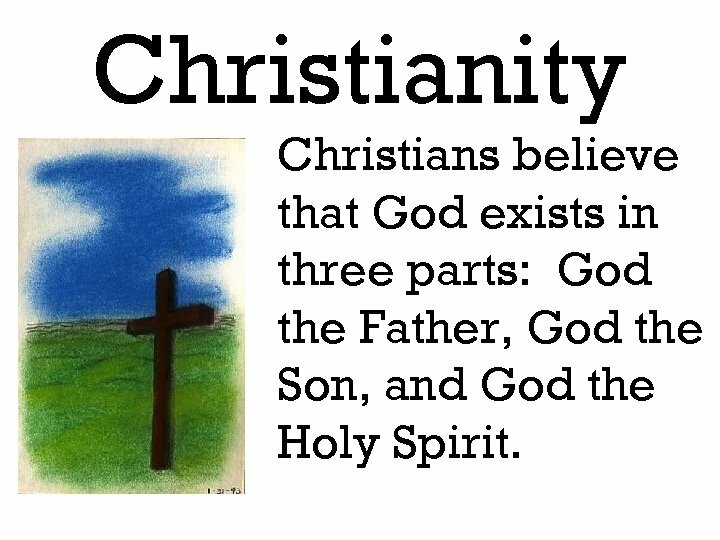 Christianity Christians believe that God exists in three parts: God the Father, God the Son, and God the Holy Spirit. 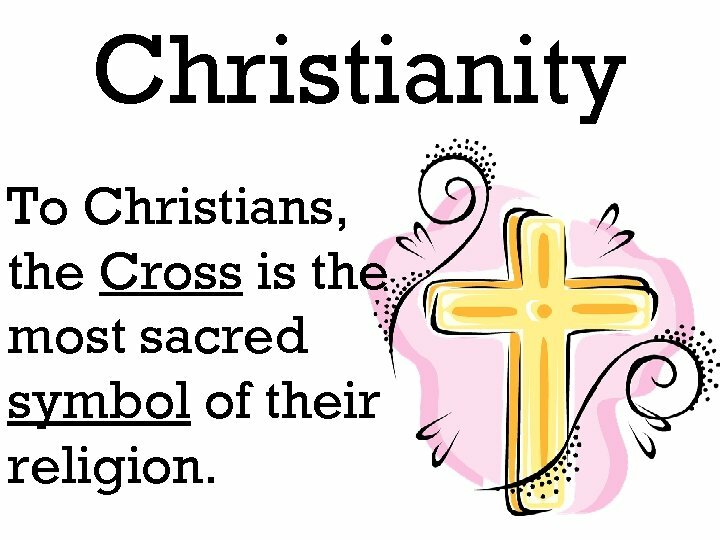 Christianity To Christians, the Cross is the most sacred symbol of their religion. 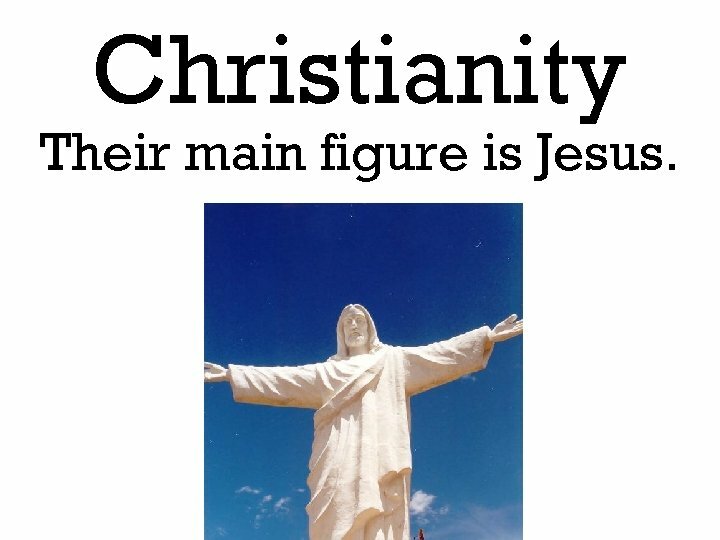 Christianity Their main figure is Jesus. 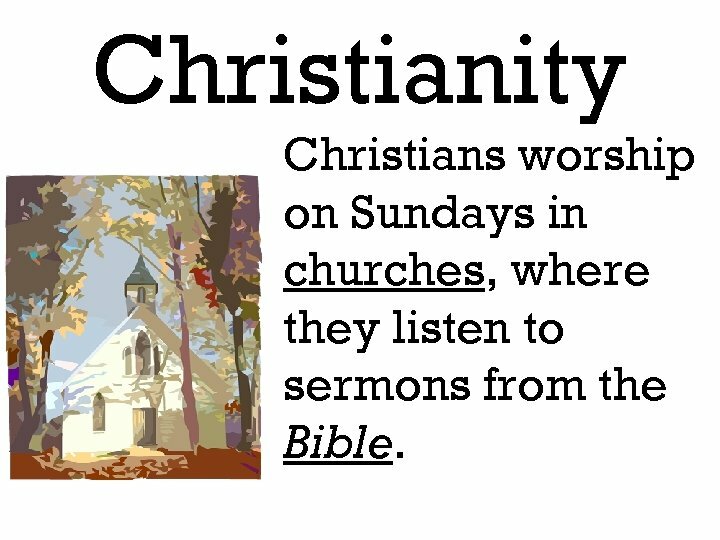 Christianity Christians worship on Sundays in churches, where they listen to sermons from the Bible. 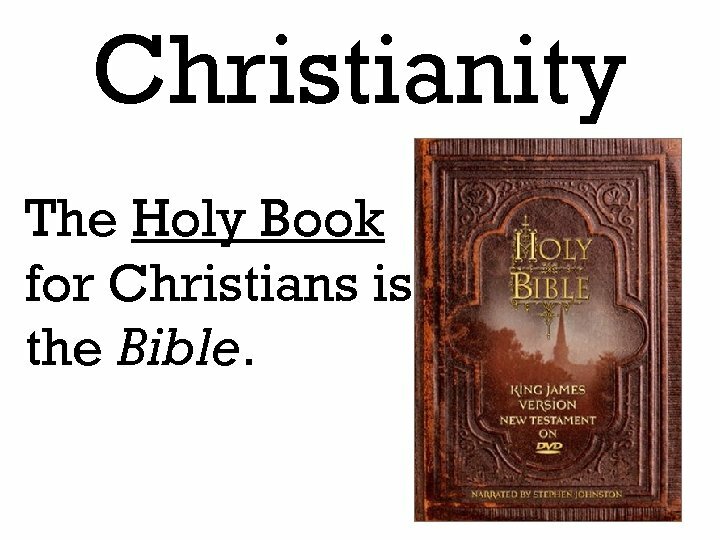 Christianity The Holy Book for Christians is the Bible. 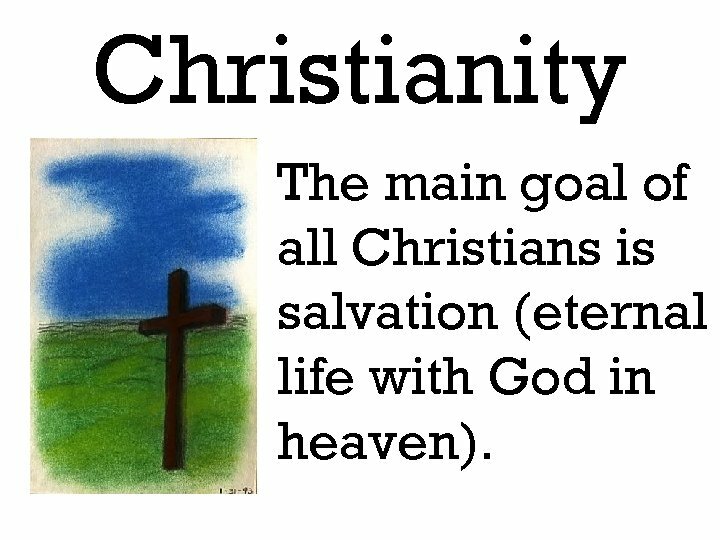 Christianity The main goal of all Christians is salvation (eternal life with God in heaven). 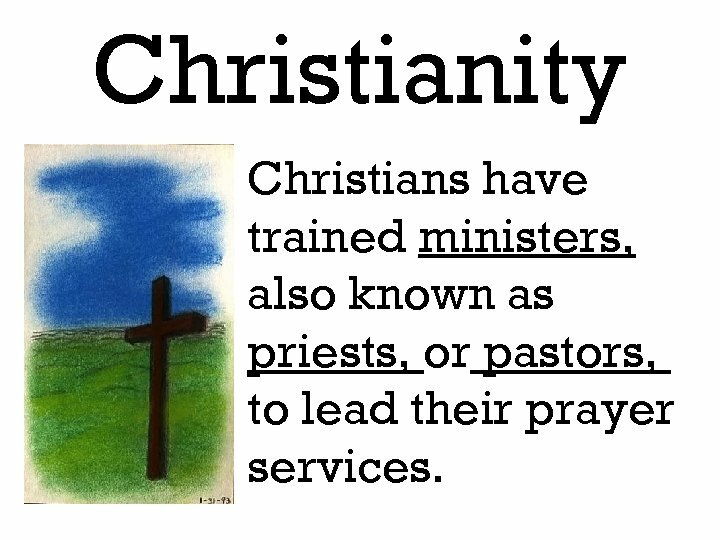 Christianity Christians have trained ministers, also known as priests, or pastors, to lead their prayer services. 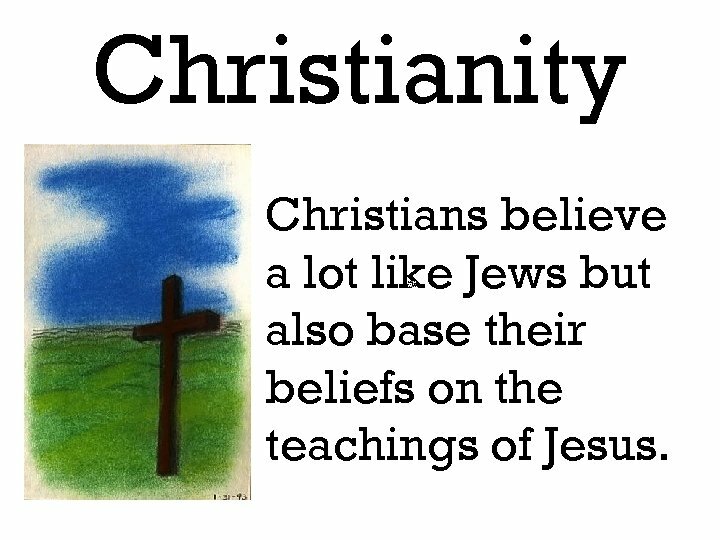 Christianity Christians believe a lot like Jews but also base their beliefs on the teachings of Jesus. 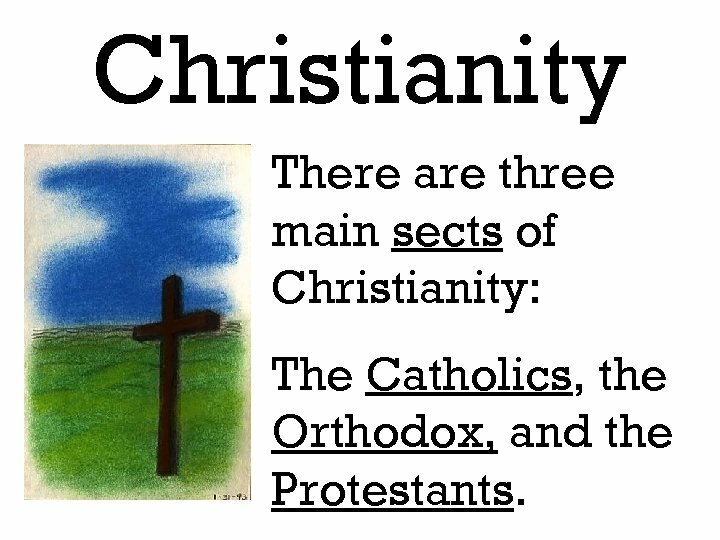 Christianity There are three main sects of Christianity: The Catholics, the Orthodox, and the Protestants. 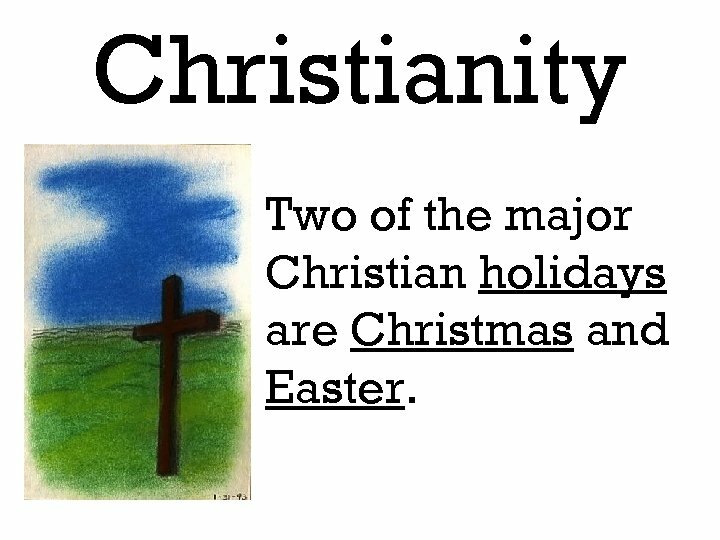 Christianity Two of the major Christian holidays are Christmas and Easter. 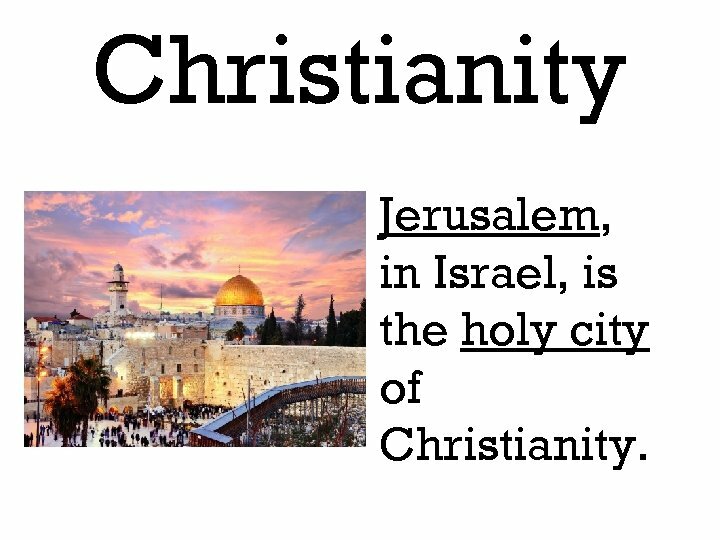 Christianity Jerusalem, in Israel, is the holy city of Christianity. 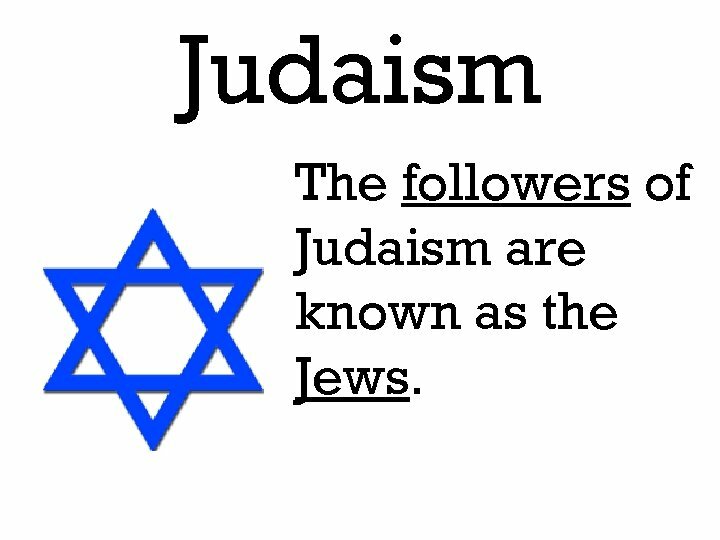 Judaism The followers of Judaism are known as the Jews. 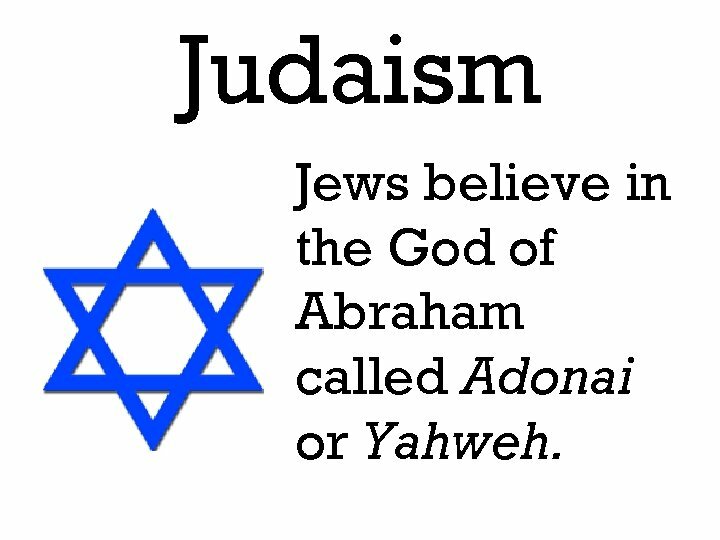 Judaism Jews believe in the God of Abraham called Adonai or Yahweh. 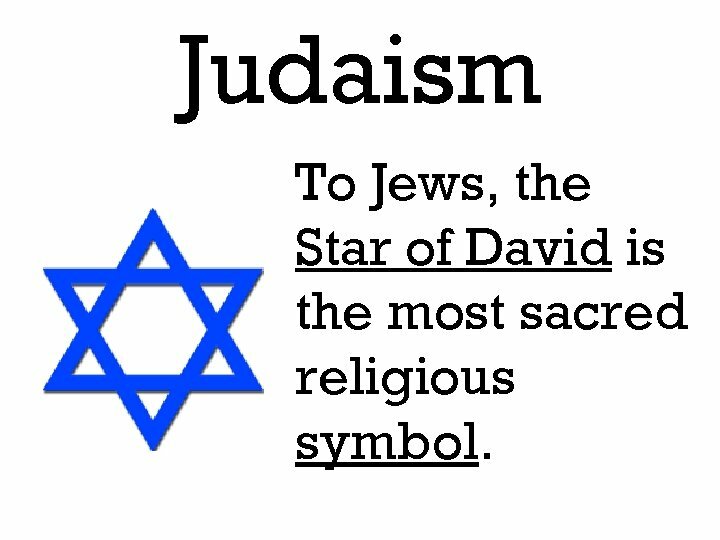 Judaism To Jews, the Star of David is the most sacred religious symbol. 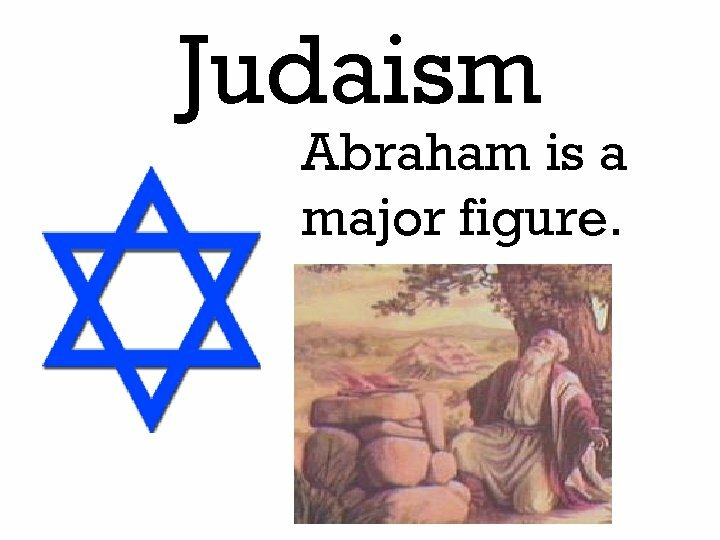 Judaism Abraham is a major figure. 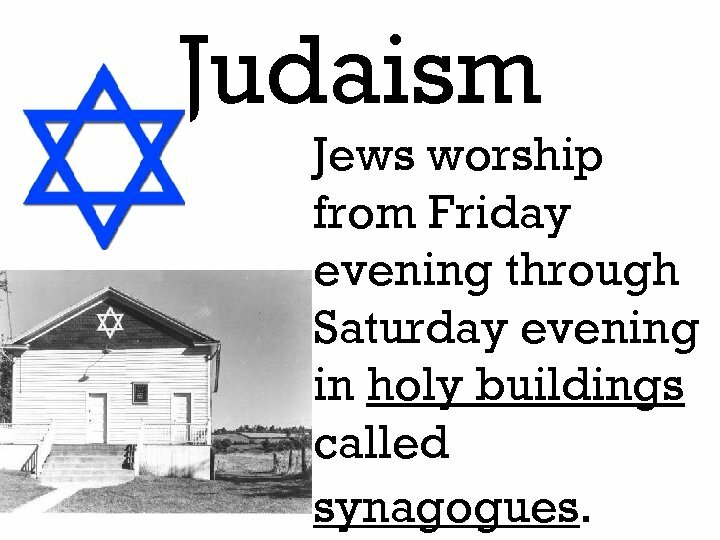 Judaism Jews worship from Friday evening through Saturday evening in holy buildings called synagogues. 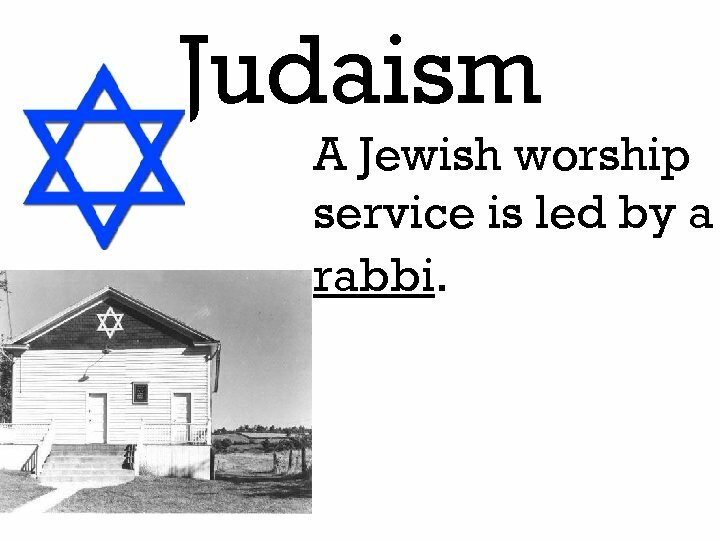 Judaism A Jewish worship service is led by a rabbi. 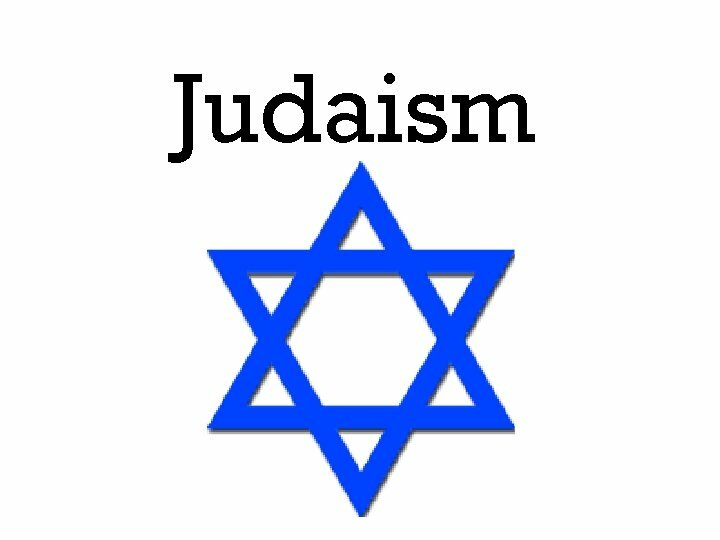 Judaism The Holy Book for the Jews is the Te. 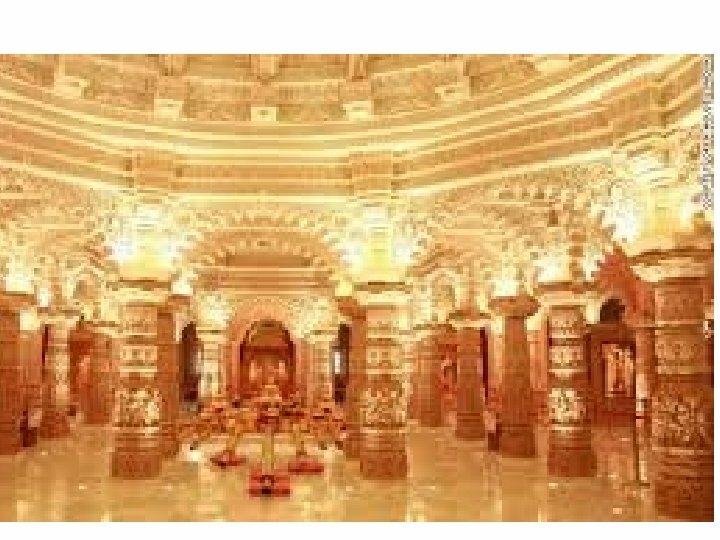 Na. 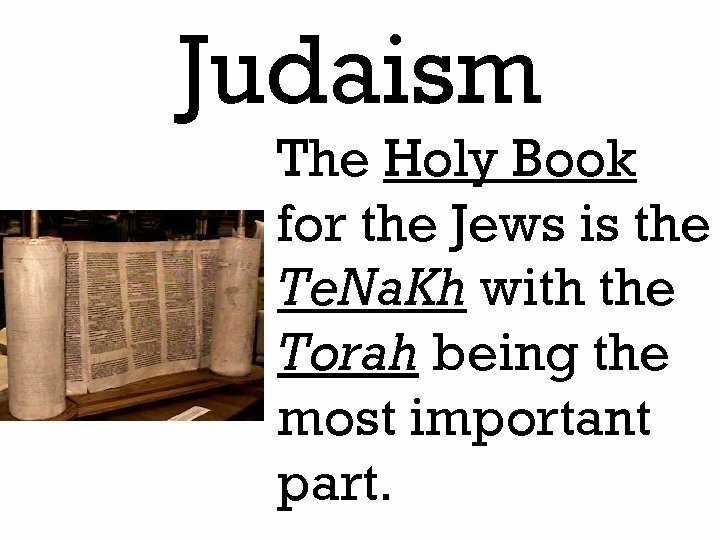 Kh with the Torah being the most important part. 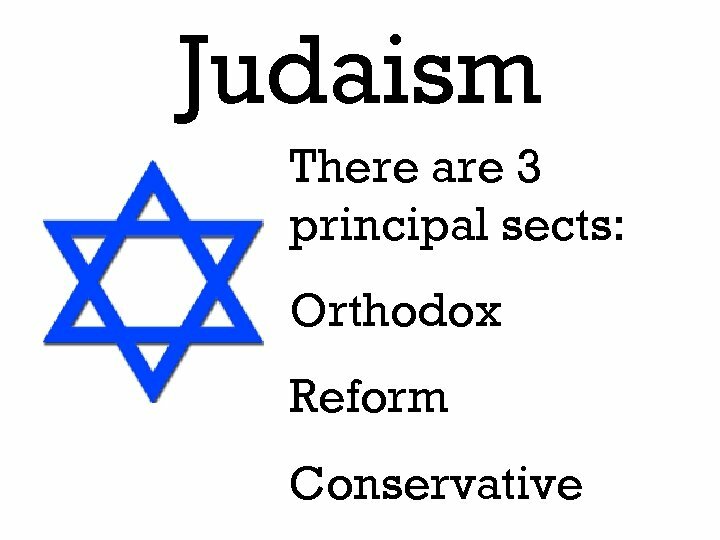 Judaism The Te. 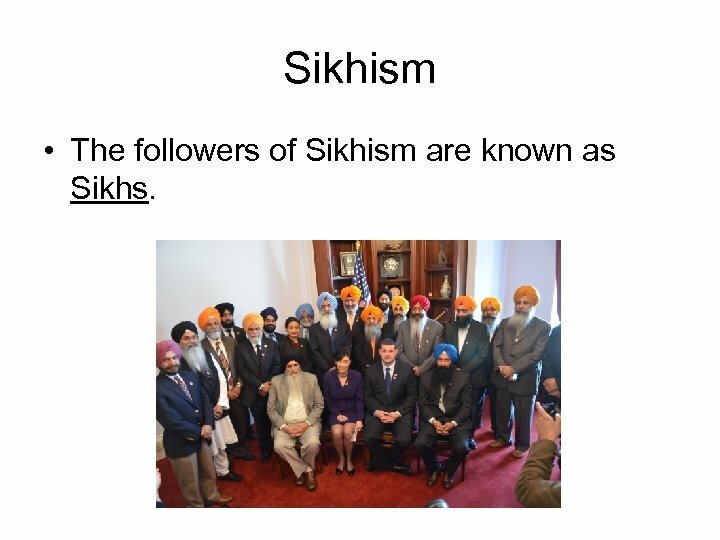 Na. 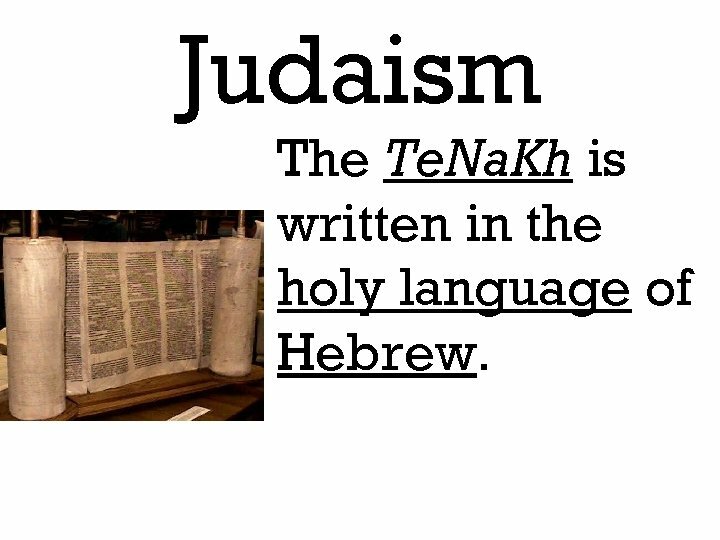 Kh is written in the holy language of Hebrew. 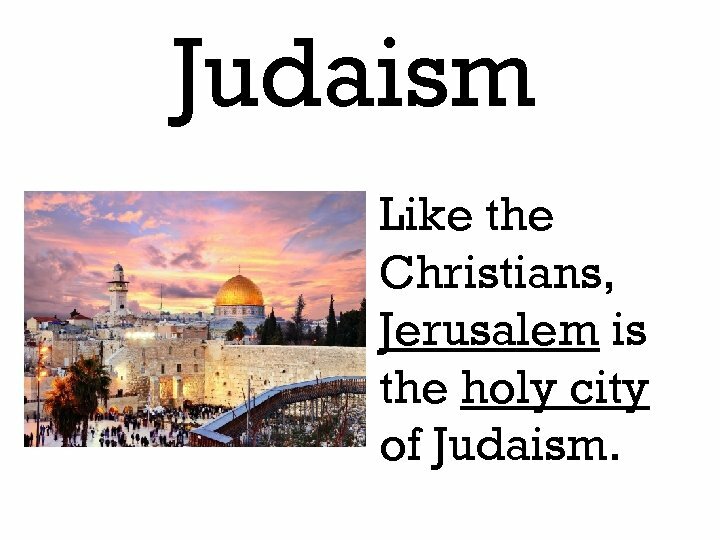 Judaism Like the Christians, Jerusalem is the holy city of Judaism. 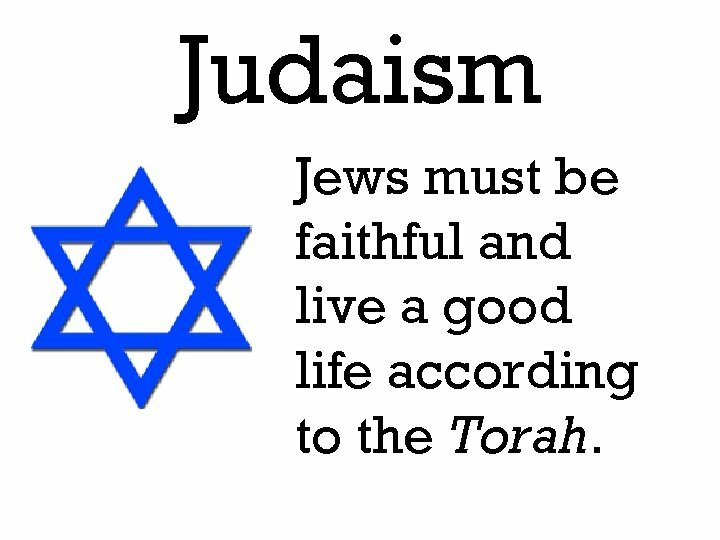 Judaism Jews must be faithful and live a good life according to the Torah. 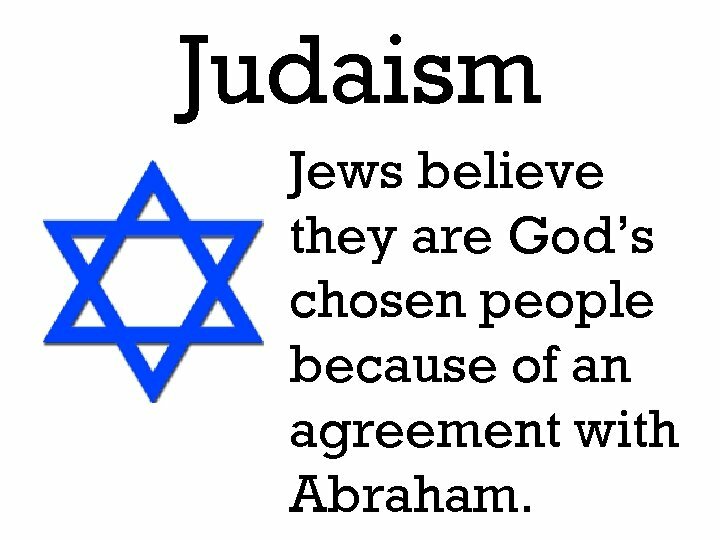 Judaism Jews believe they are God’s chosen people because of an agreement with Abraham. 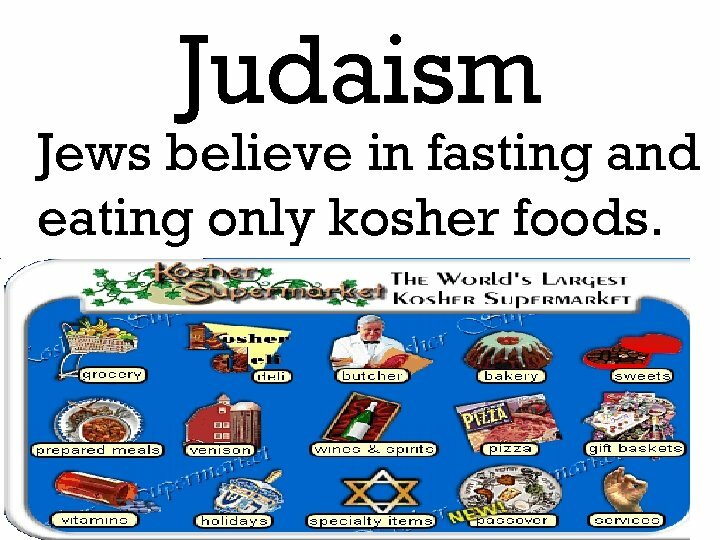 Judaism Jews believe in fasting and eating only kosher foods. 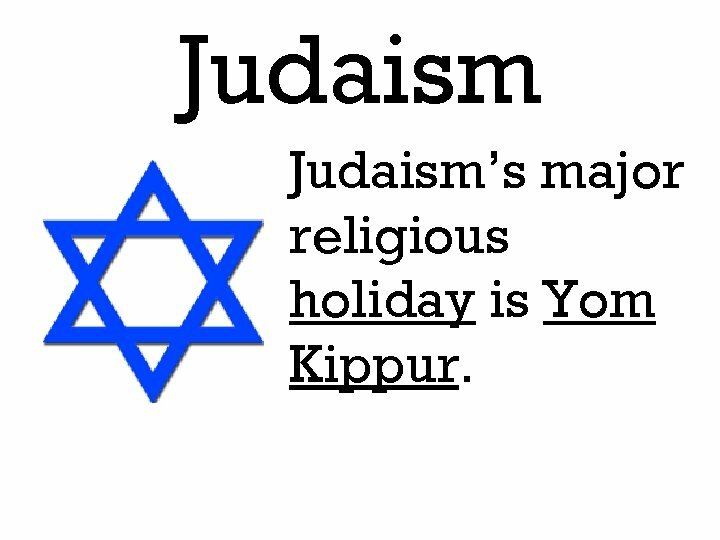 Judaism’s major religious holiday is Yom Kippur. 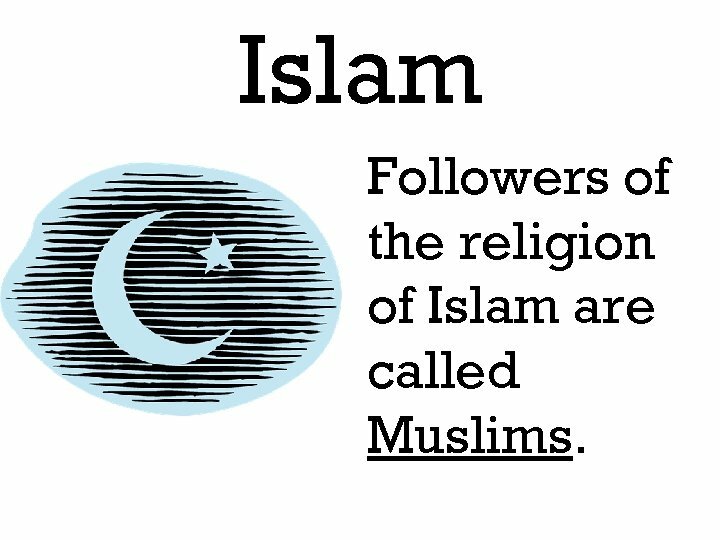 Islam Followers of the religion of Islam are called Muslims. 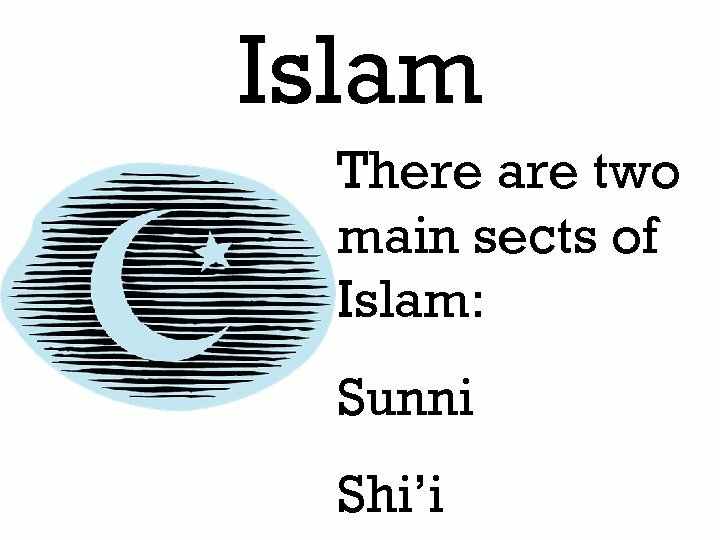 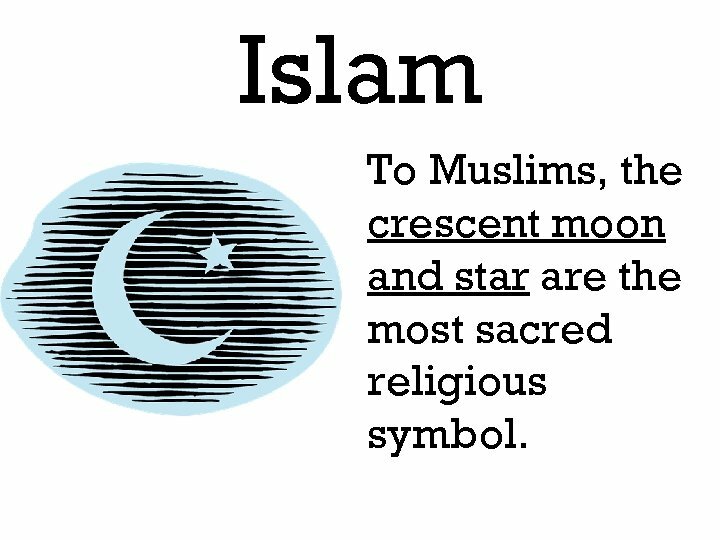 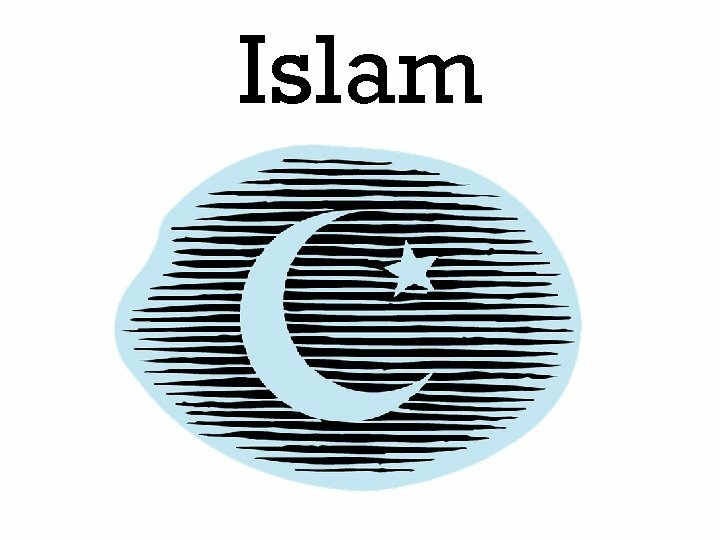 Islam To Muslims, the crescent moon and star are the most sacred religious symbol. 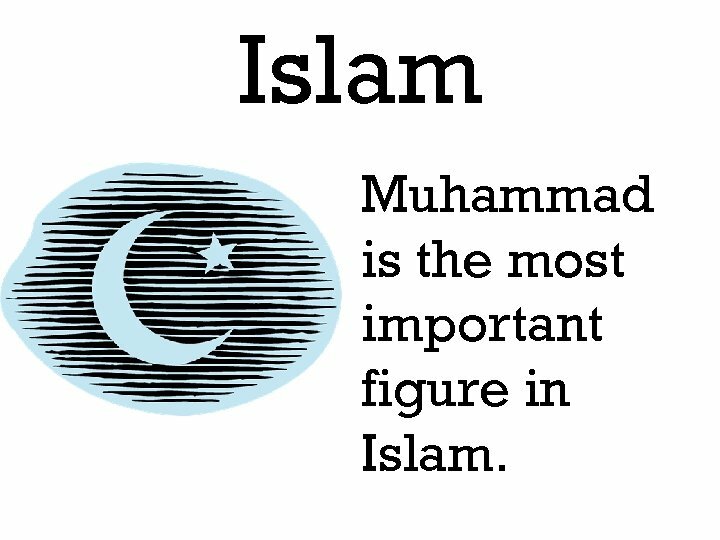 Islam Muhammad is the most important figure in Islam. 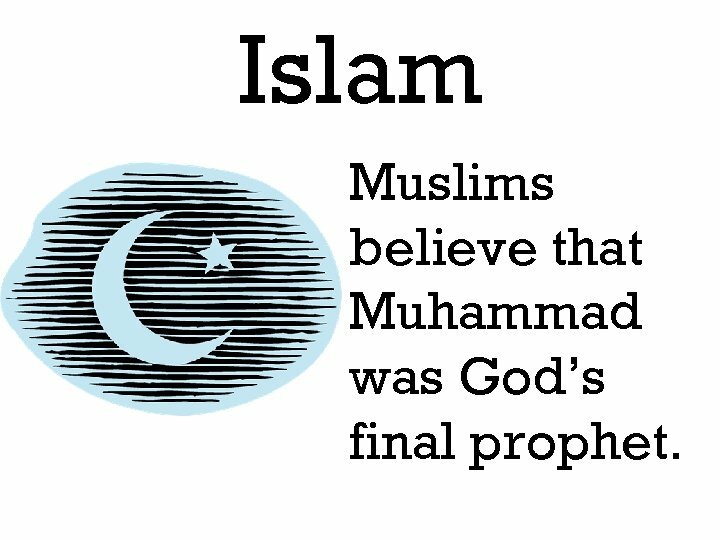 Islam Muslims believe that Muhammad was God’s final prophet. 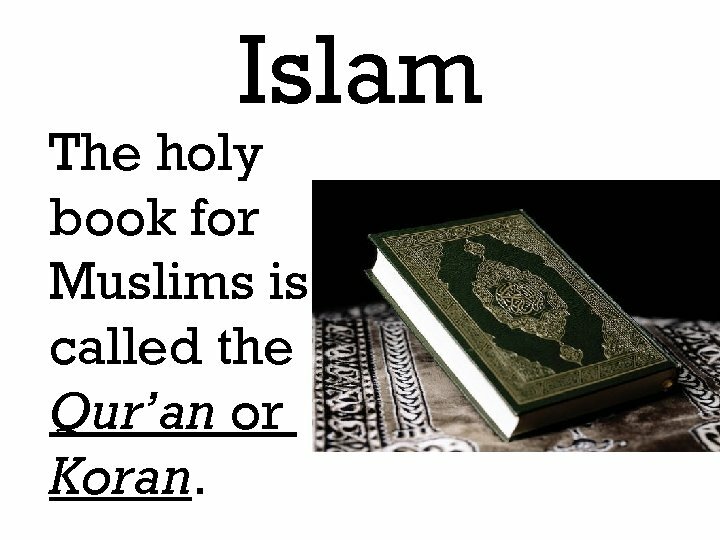 Islam The holy book for Muslims is called the Qur’an or Koran. 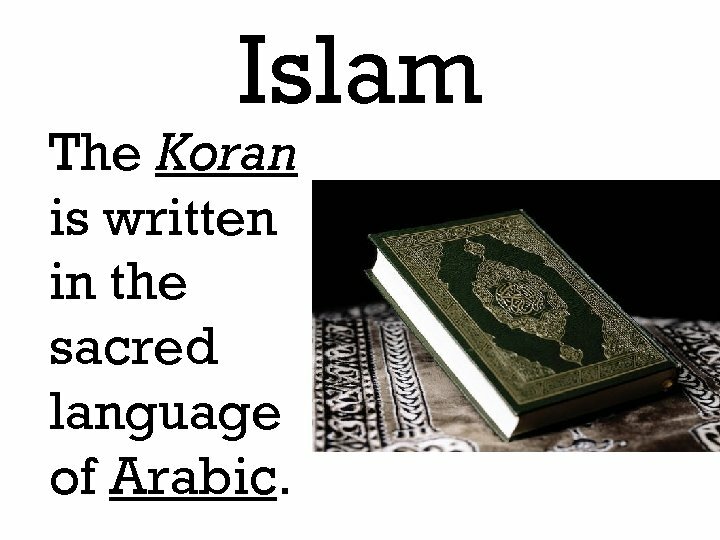 Islam The Koran is written in the sacred language of Arabic. 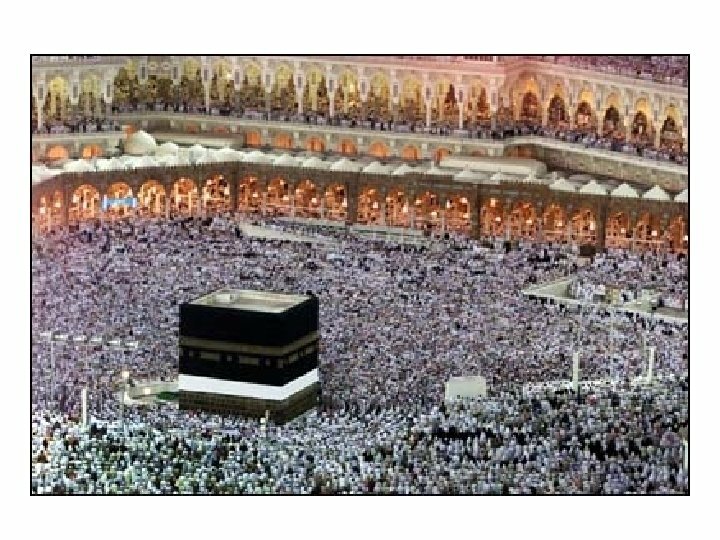 Islam Muslims worship in mosques. 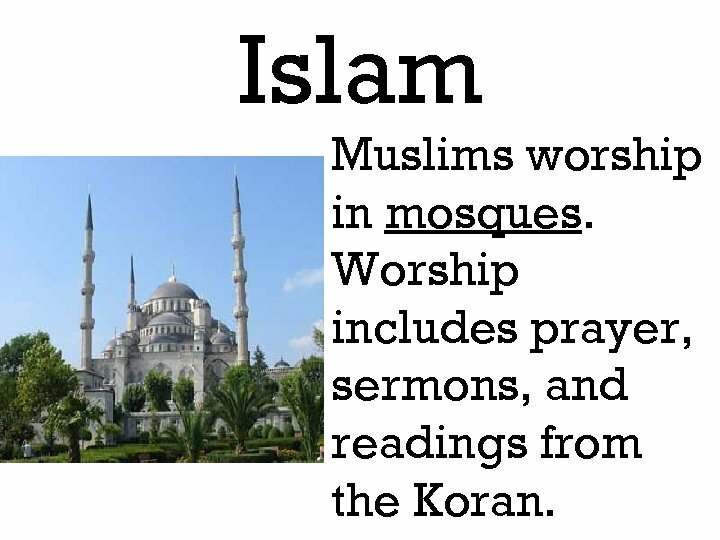 Worship includes prayer, sermons, and readings from the Koran. 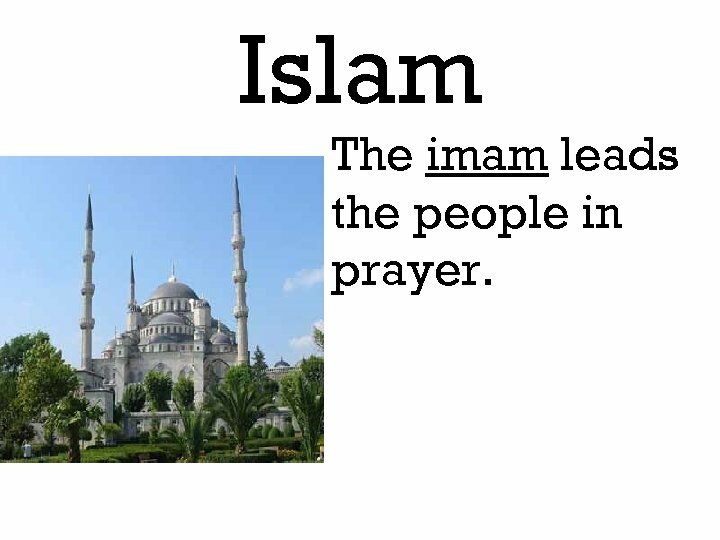 Islam The imam leads the people in prayer. 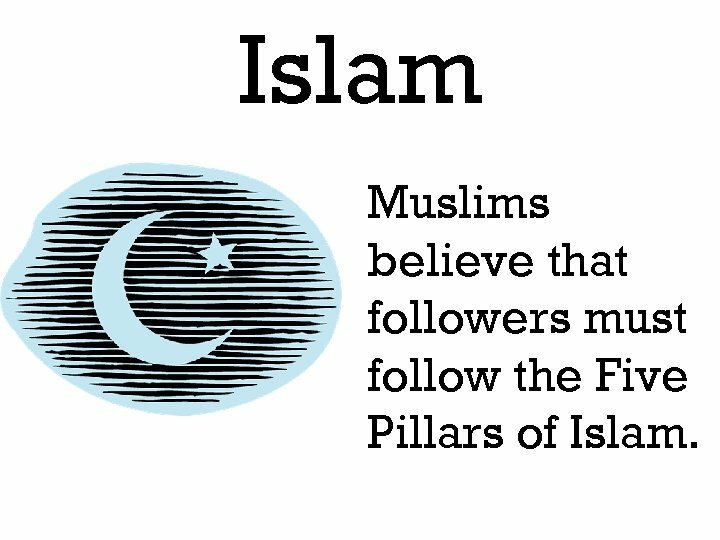 Islam Muslims believe that followers must follow the Five Pillars of Islam. 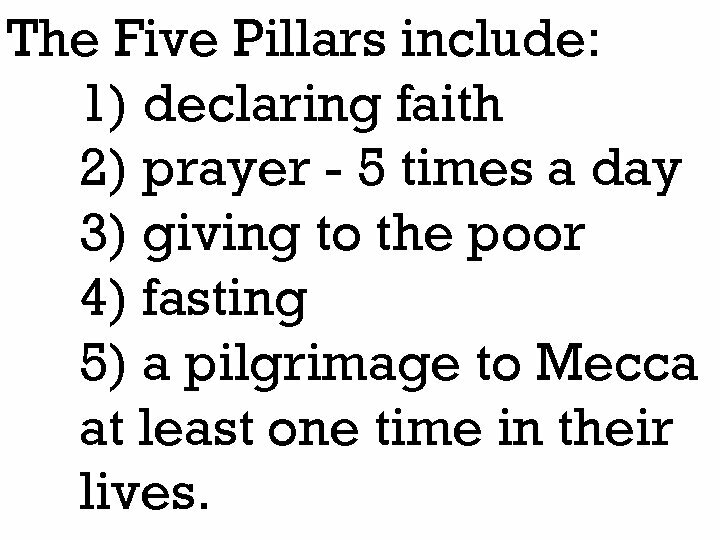 The Five Pillars include: 1) declaring faith 2) prayer - 5 times a day 3) giving to the poor 4) fasting 5) a pilgrimage to Mecca at least one time in their lives. 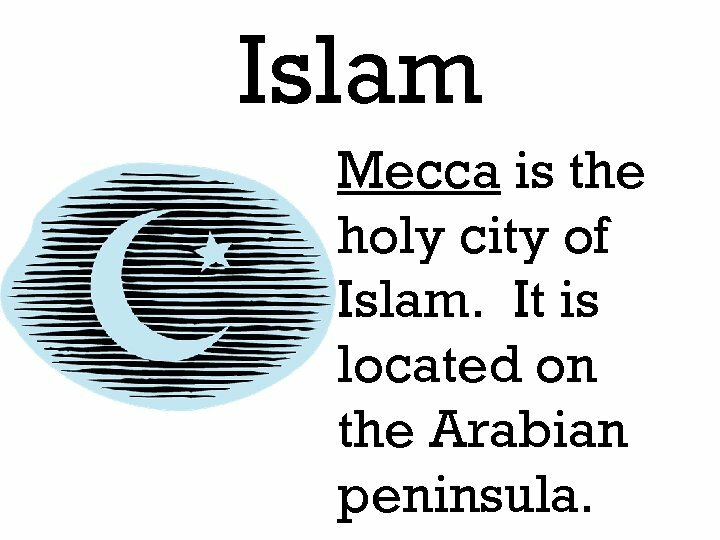 Islam Mecca is the holy city of Islam. 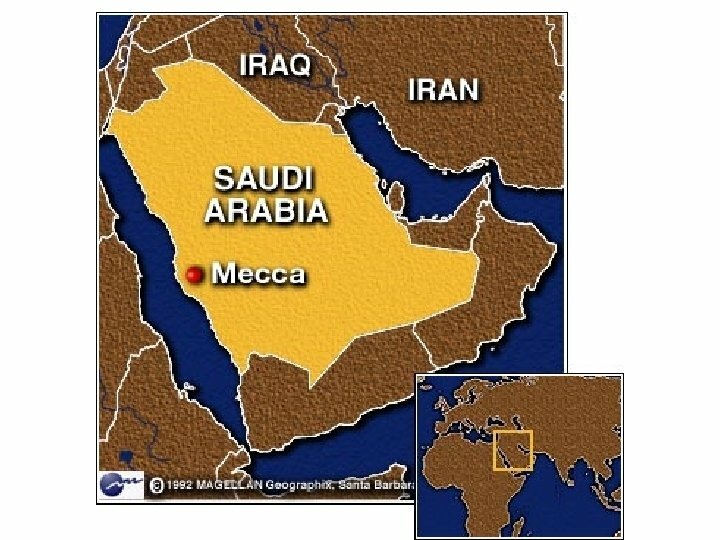 It is located on the Arabian peninsula. 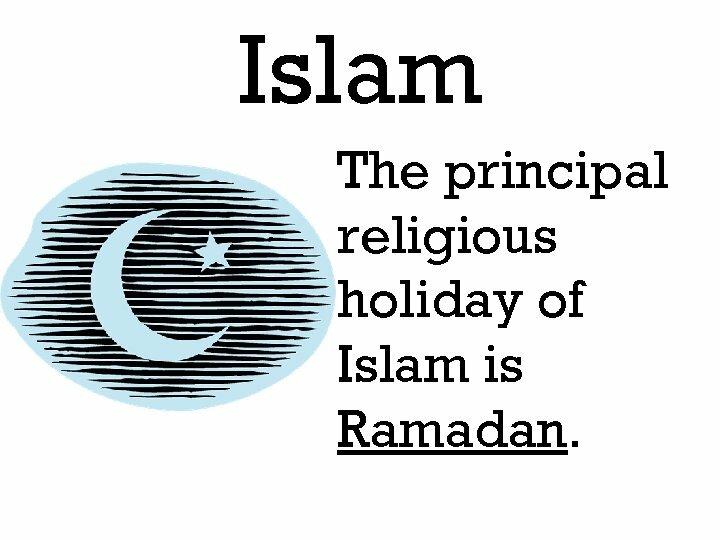 Islam The principal religious holiday of Islam is Ramadan. 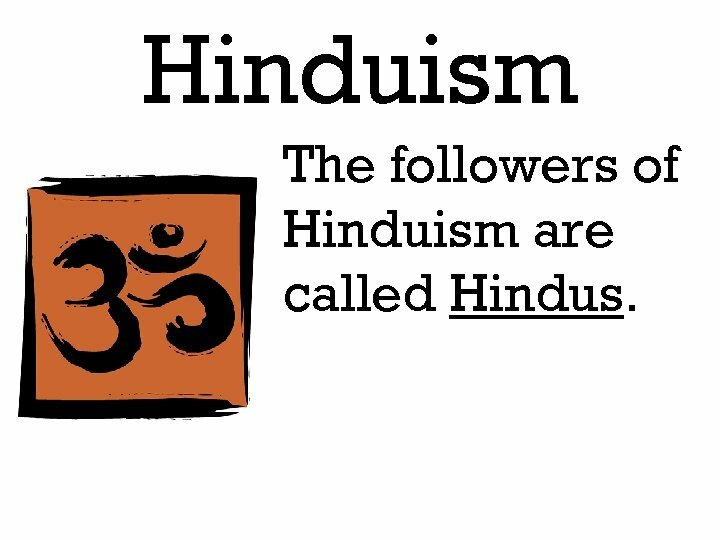 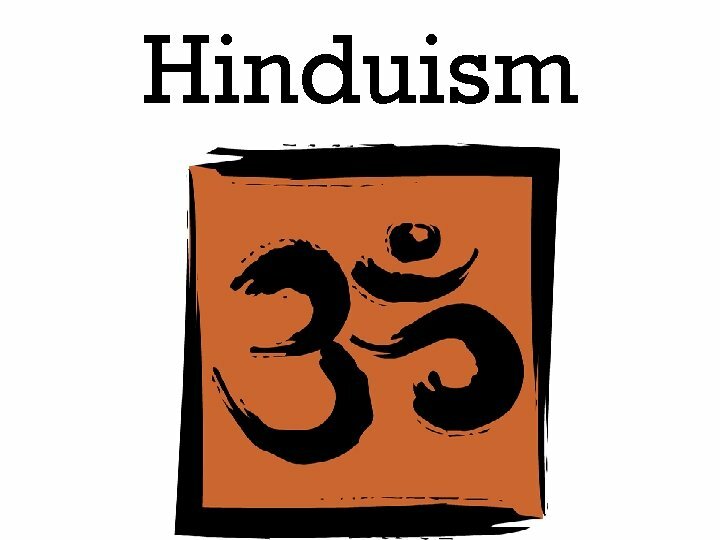 Hinduism The followers of Hinduism are called Hindus. 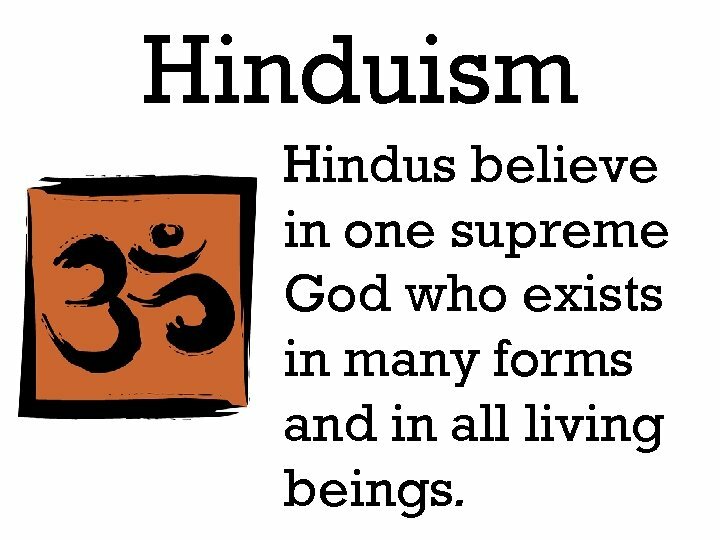 Hinduism Hindus believe in one supreme God who exists in many forms and in all living beings. Hinduism To Hindus, the Aum is the most sacred religious symbol. 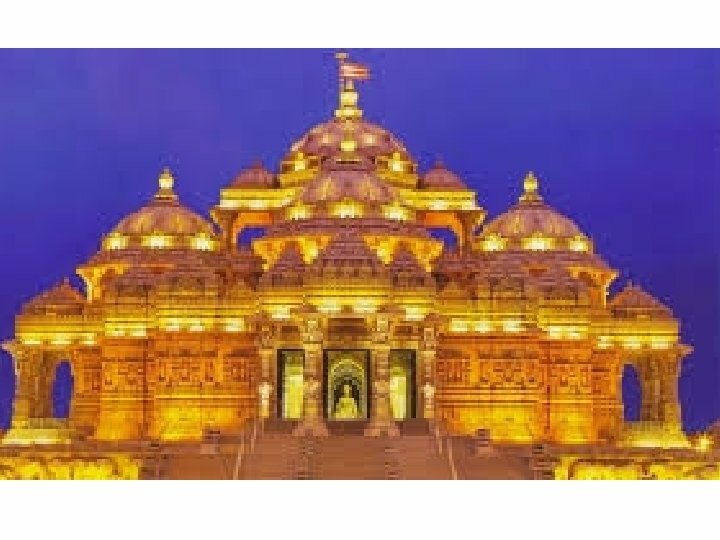 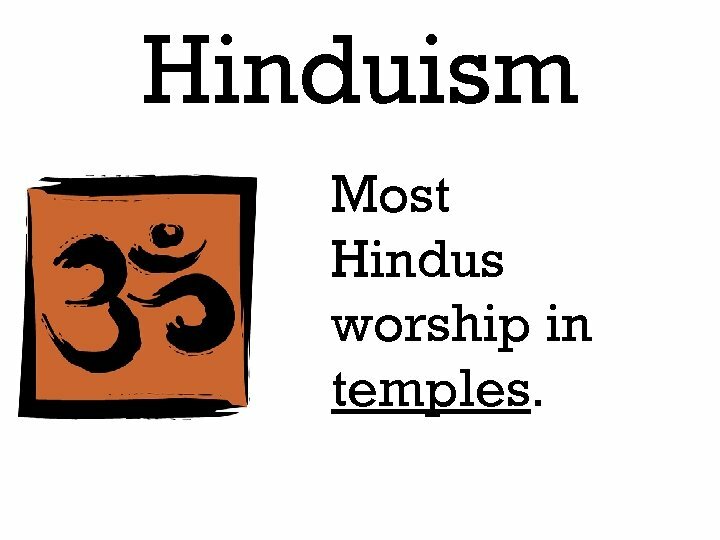 Hinduism Most Hindus worship in temples. 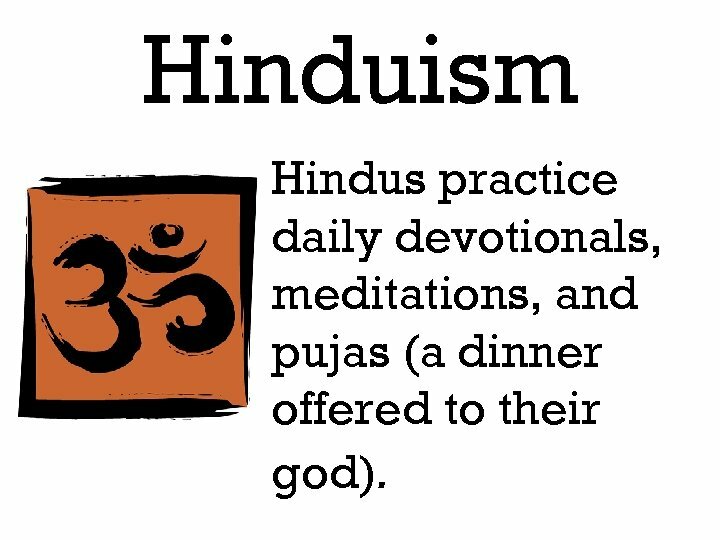 Hinduism Hindus practice daily devotionals, meditations, and pujas (a dinner offered to their god). 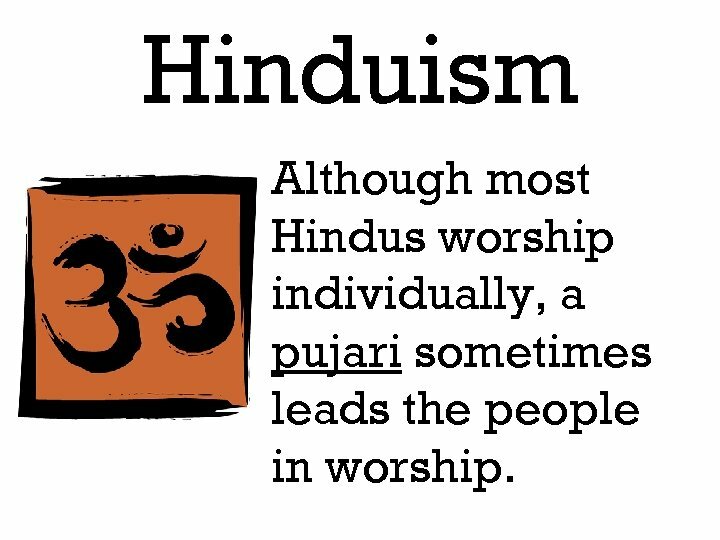 Hinduism Although most Hindus worship individually, a pujari sometimes leads the people in worship. 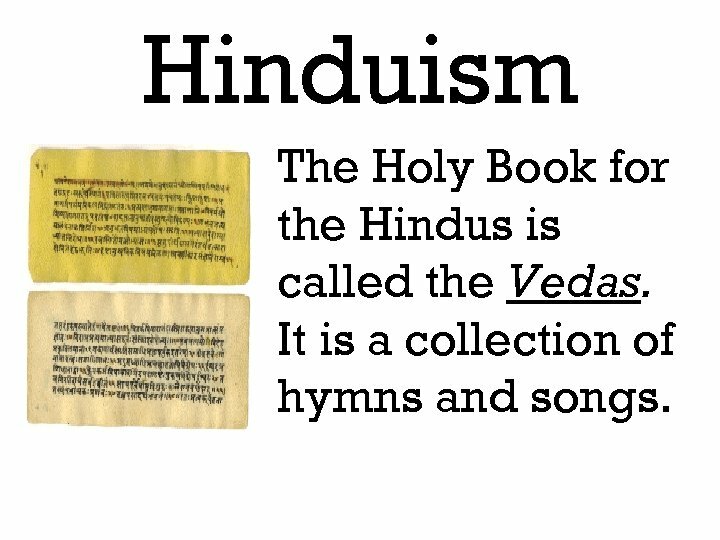 Hinduism The Holy Book for the Hindus is called the Vedas. 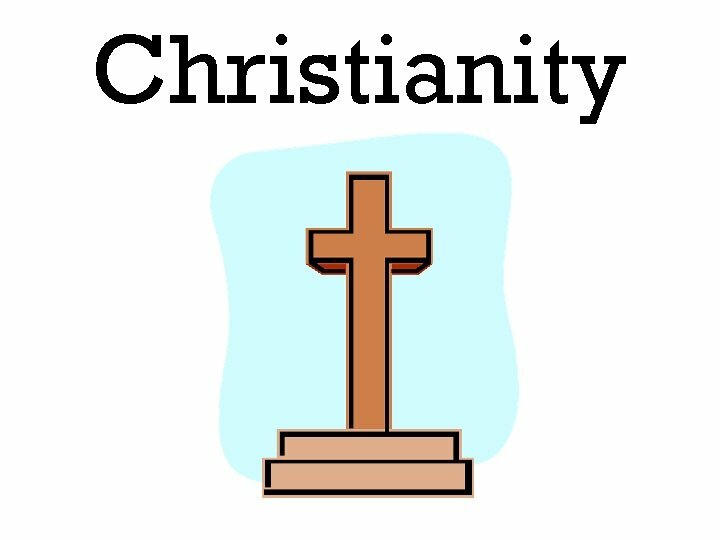 It is a collection of hymns and songs. 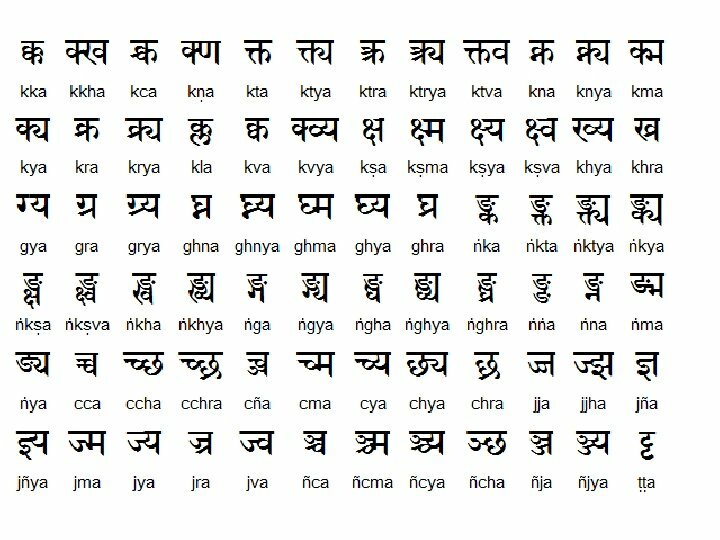 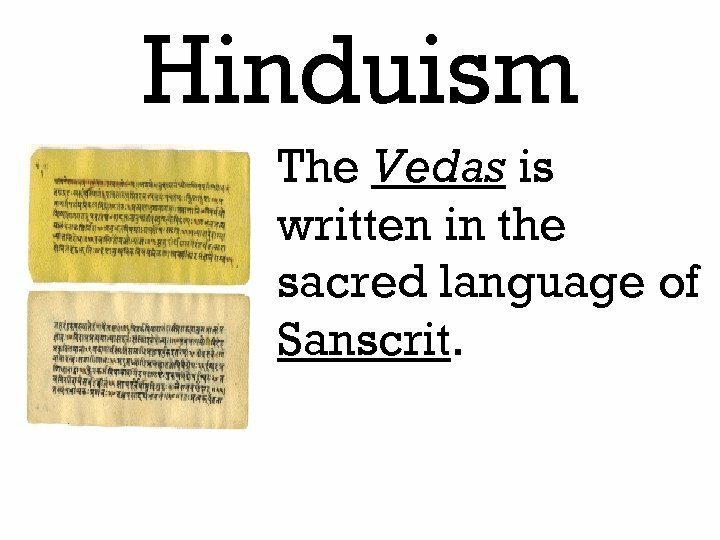 Hinduism The Vedas is written in the sacred language of Sanscrit. 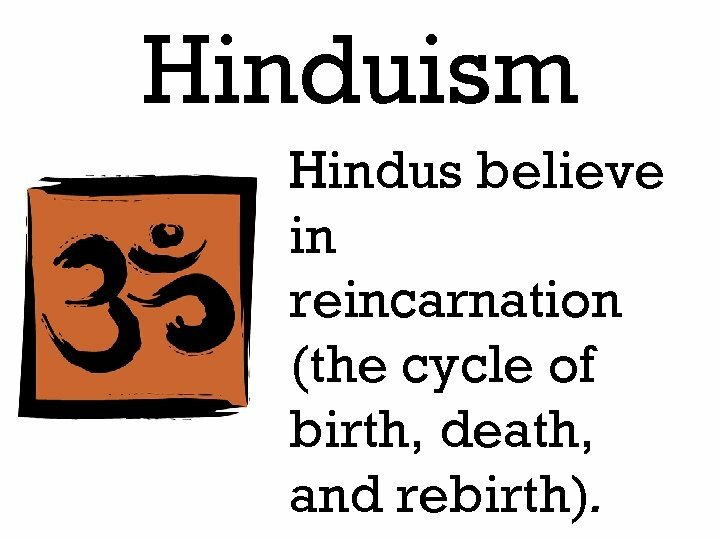 Hinduism Hindus believe in reincarnation (the cycle of birth, death, and rebirth). 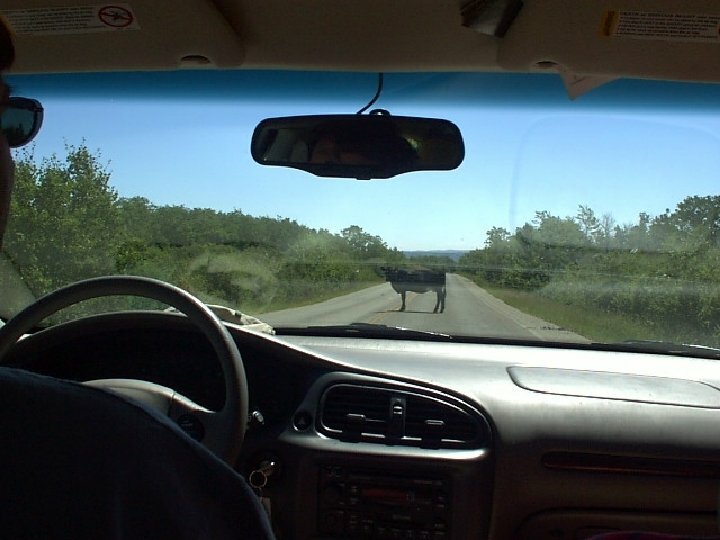 Hinduism Hindus also believe in karma (law of cause and effect) and they believe animals are sacred. Hinduism There are no major religious figures in Hinduism, but cows are considered holy. 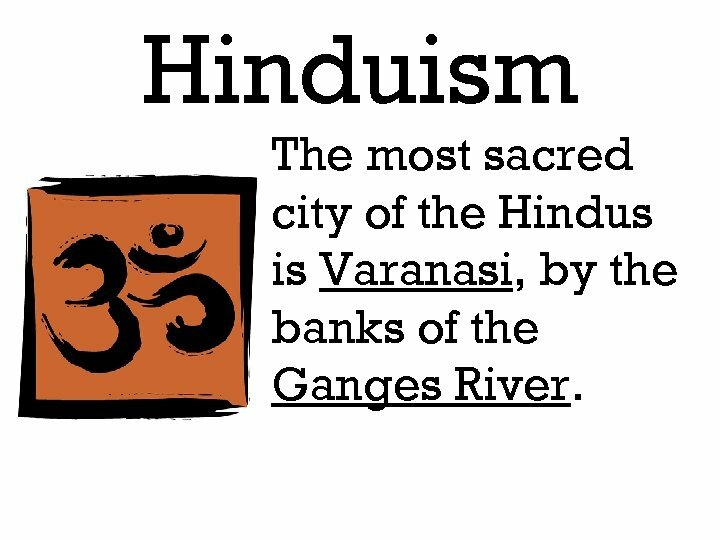 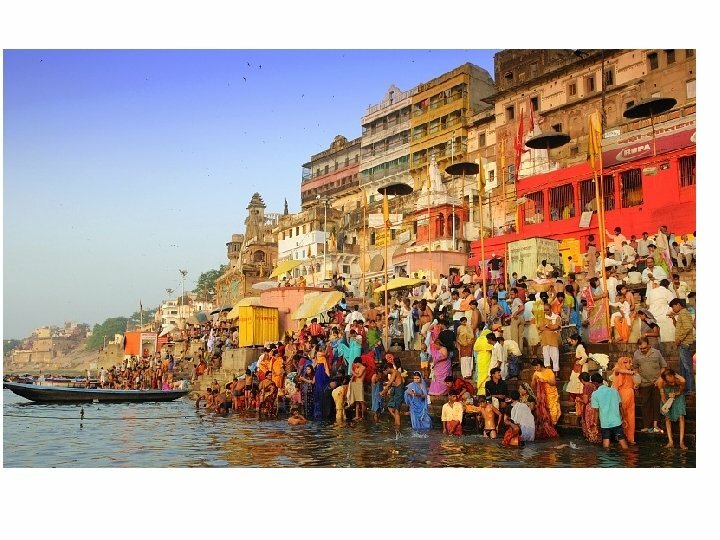 Hinduism The most sacred city of the Hindus is Varanasi, by the banks of the Ganges River. 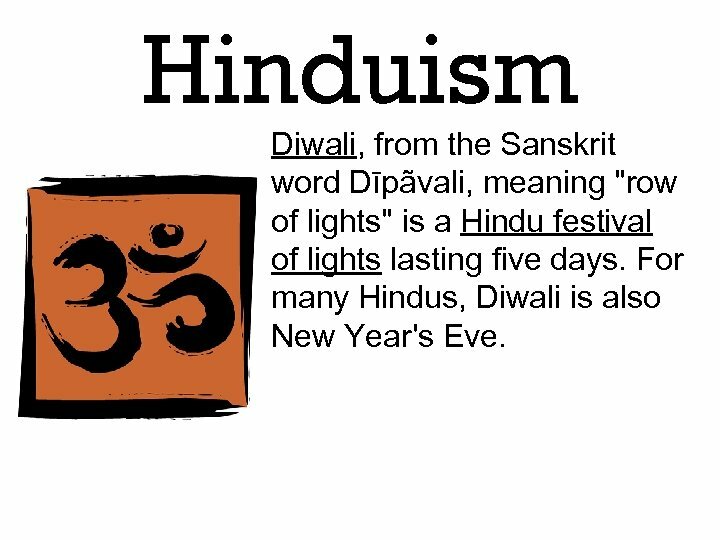 Hinduism Diwali, from the Sanskrit word Dīpãvali, meaning "row of lights" is a Hindu festival of lights lasting five days. 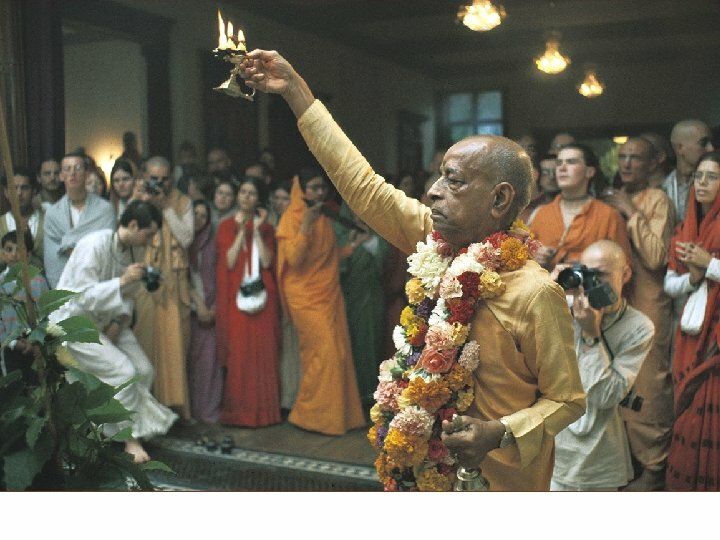 For many Hindus, Diwali is also New Year's Eve. 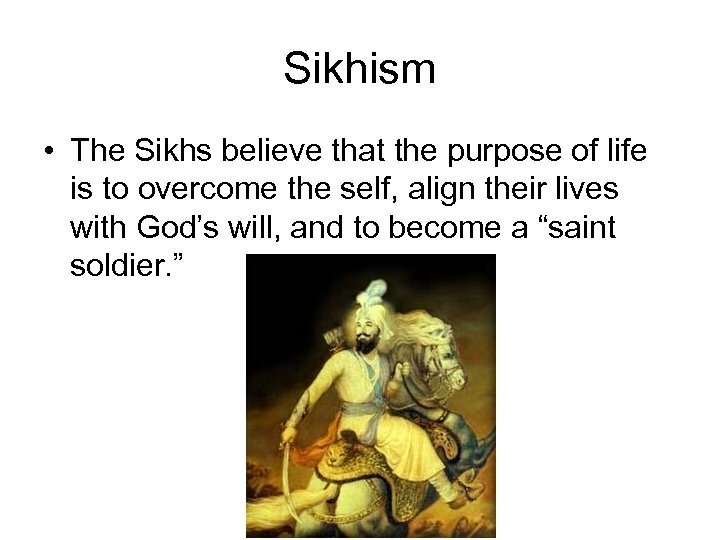 Sikhism • The followers of Sikhism are known as Sikhs. 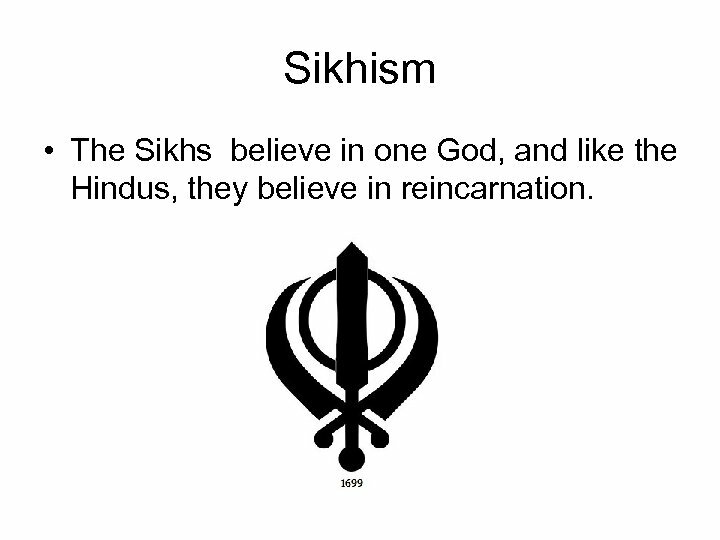 Sikhism • The Sikhs believe in one God, and like the Hindus, they believe in reincarnation. 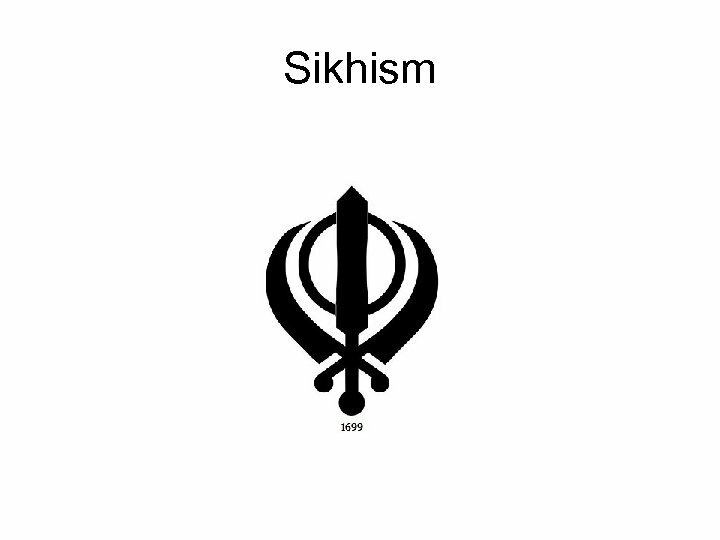 Sikhism • The khanda is the most sacred symbol of their religion. 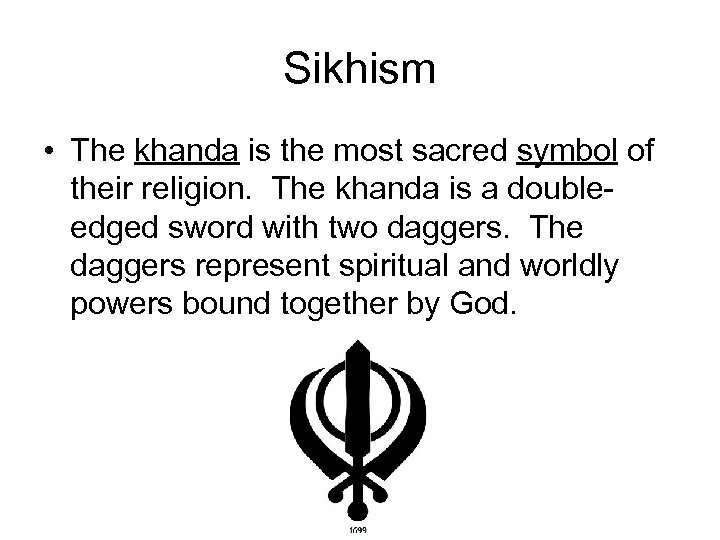 The khanda is a doubleedged sword with two daggers. 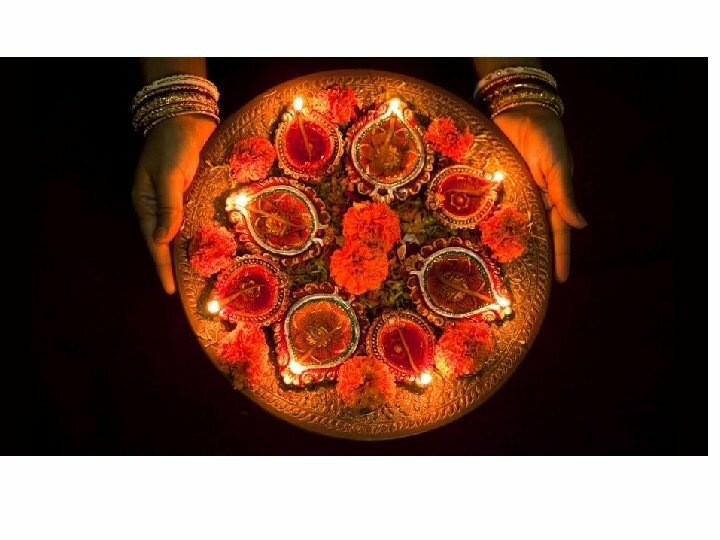 The daggers represent spiritual and worldly powers bound together by God. 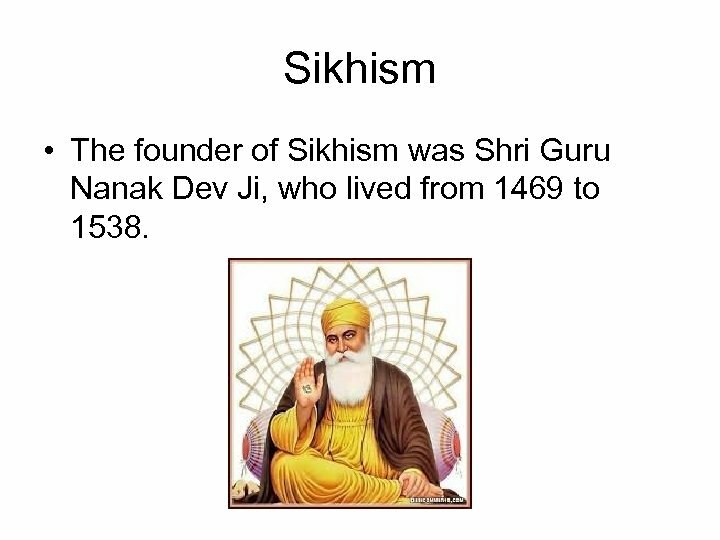 Sikhism • The founder of Sikhism was Shri Guru Nanak Dev Ji, who lived from 1469 to 1538. 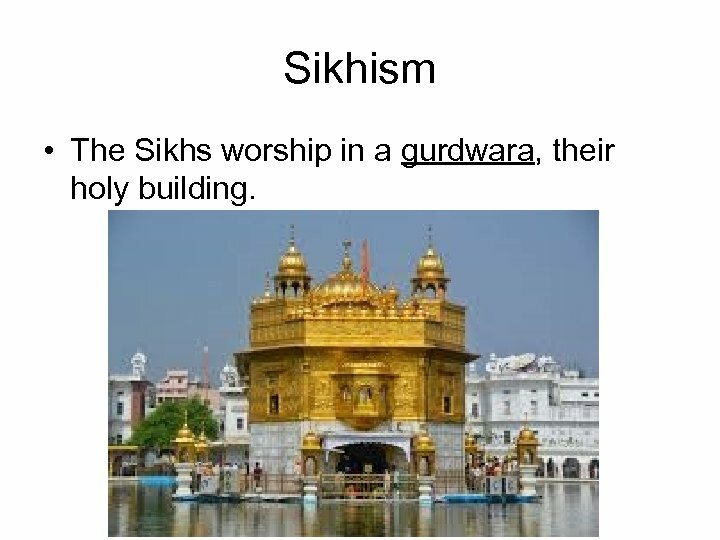 Sikhism • The Sikhs worship in a gurdwara, their holy building. 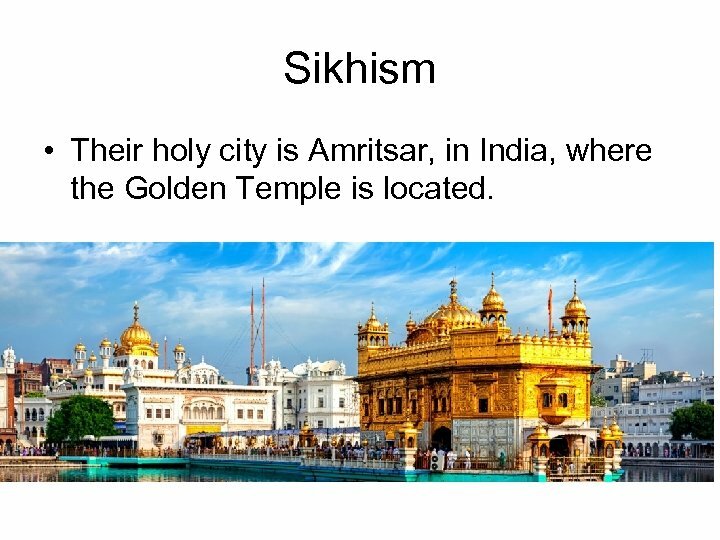 Sikhism • Their holy city is Amritsar, in India, where the Golden Temple is located. 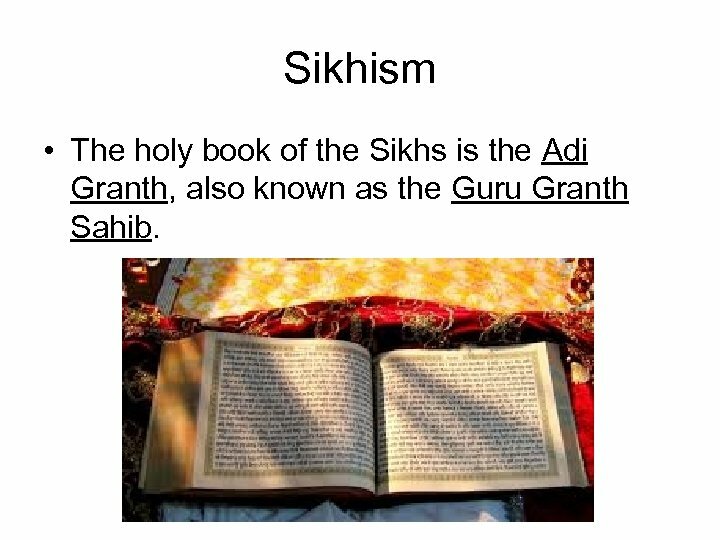 Sikhism • The holy book of the Sikhs is the Adi Granth, also known as the Guru Granth Sahib. 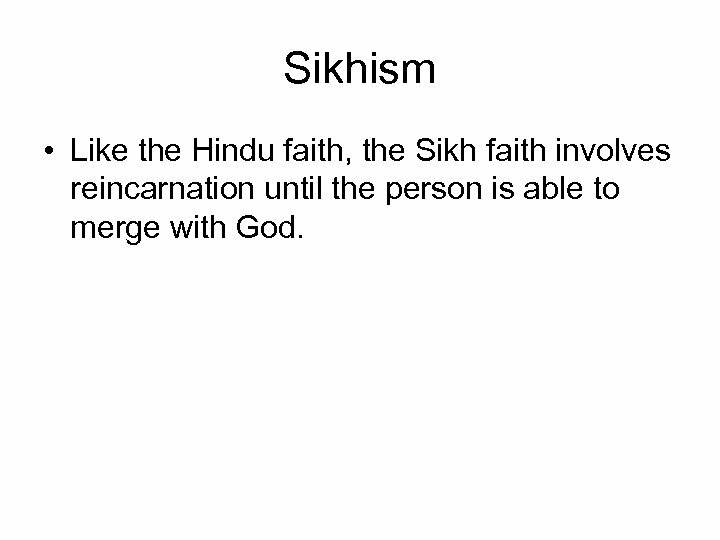 Sikhism • Like the Hindu faith, the Sikh faith involves reincarnation until the person is able to merge with God. 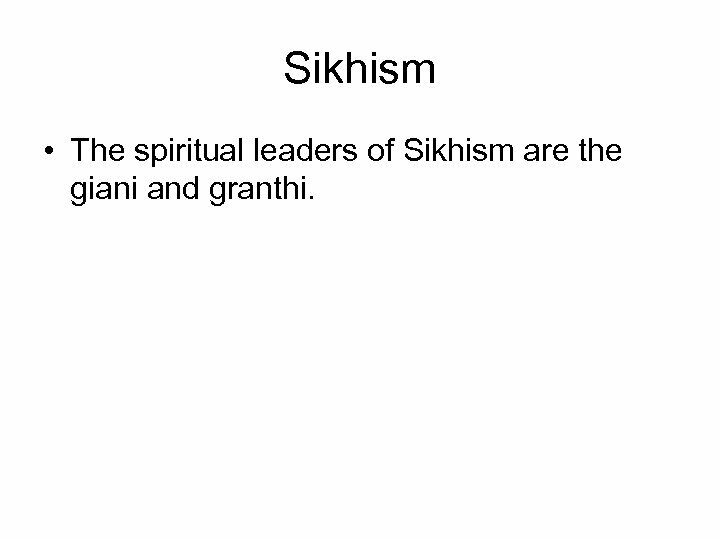 Sikhism • The spiritual leaders of Sikhism are the giani and granthi. 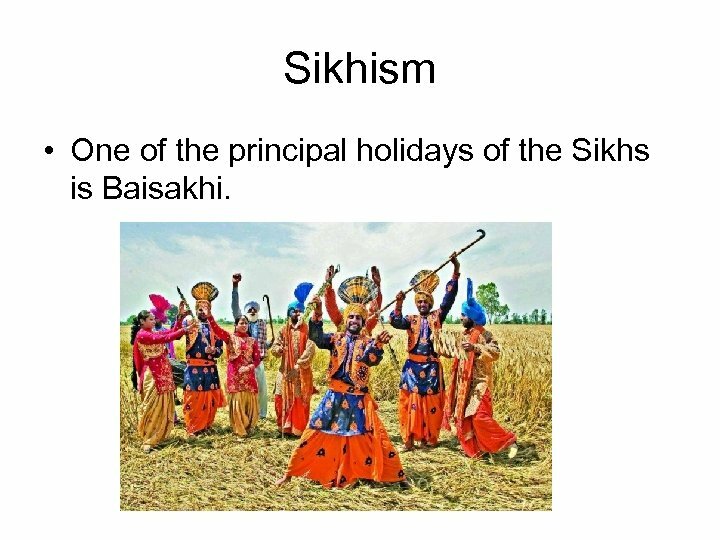 Sikhism • One of the principal holidays of the Sikhs is Baisakhi. 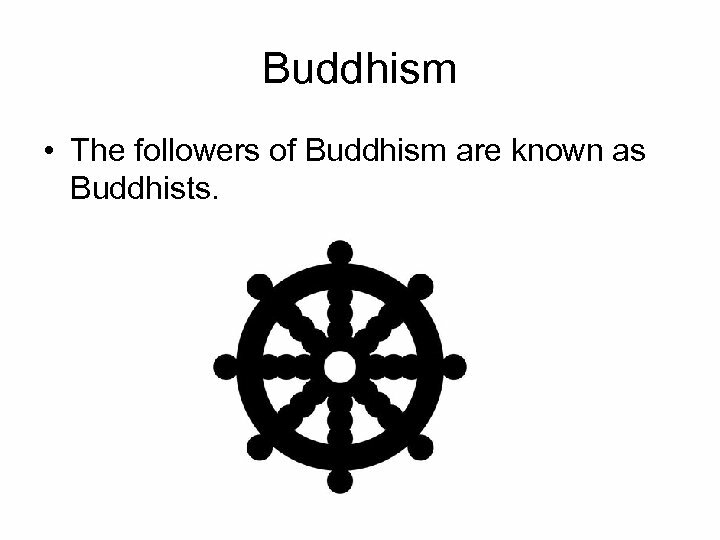 Buddhism • The followers of Buddhism are known as Buddhists. 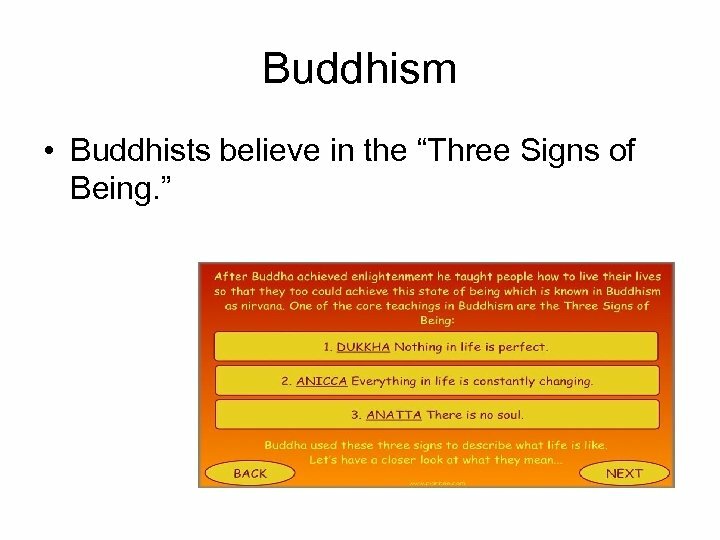 Buddhism • . 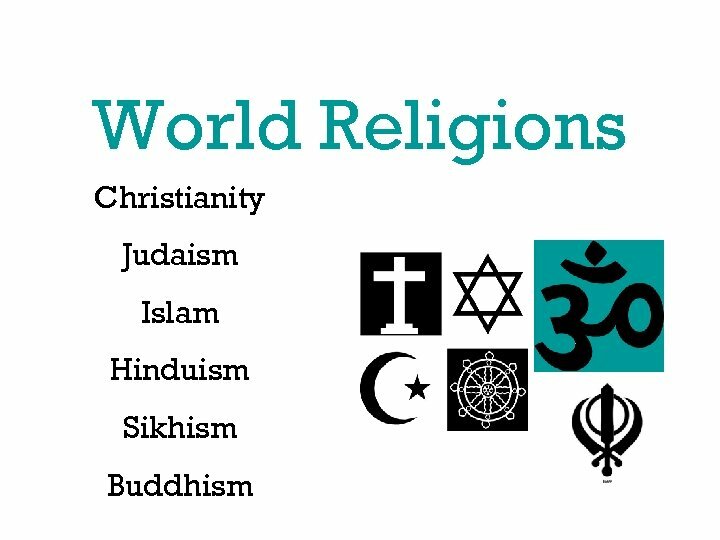 Unlike the other major world religions, Buddhism is not centered on the relationship between people and God. 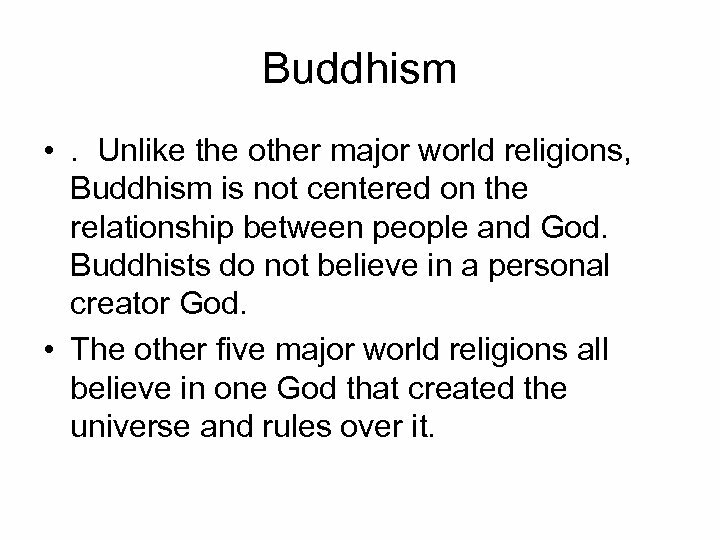 Buddhists do not believe in a personal creator God. 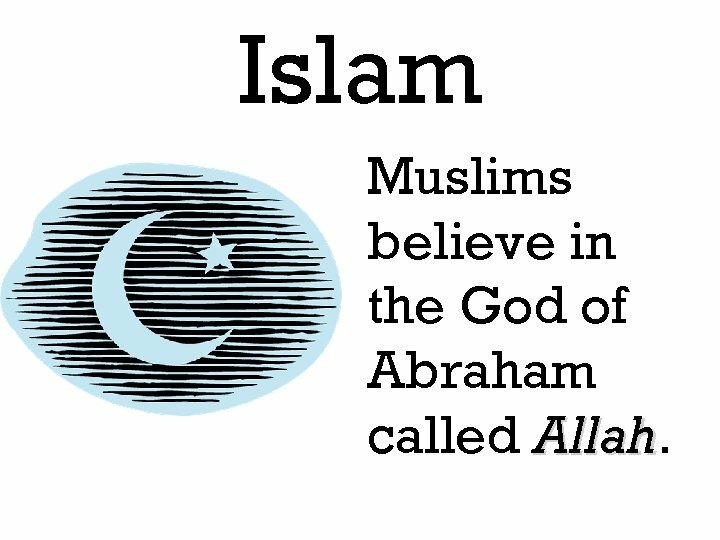 • The other five major world religions all believe in one God that created the universe and rules over it. 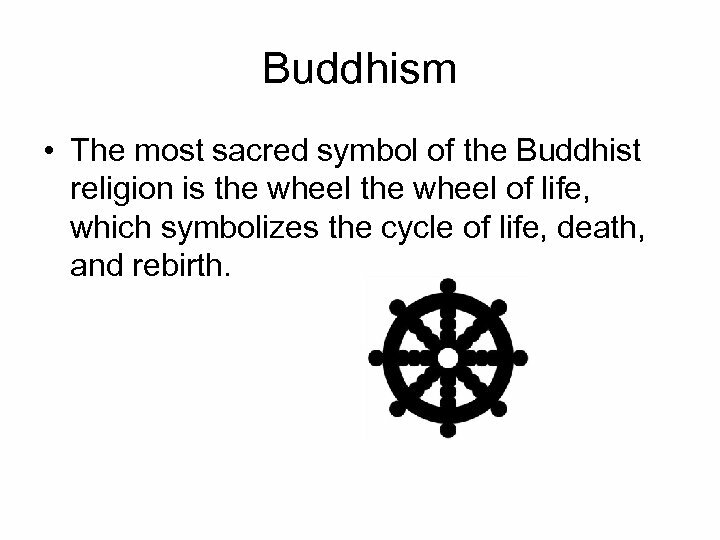 Buddhism • The most sacred symbol of the Buddhist religion is the wheel of life, which symbolizes the cycle of life, death, and rebirth. 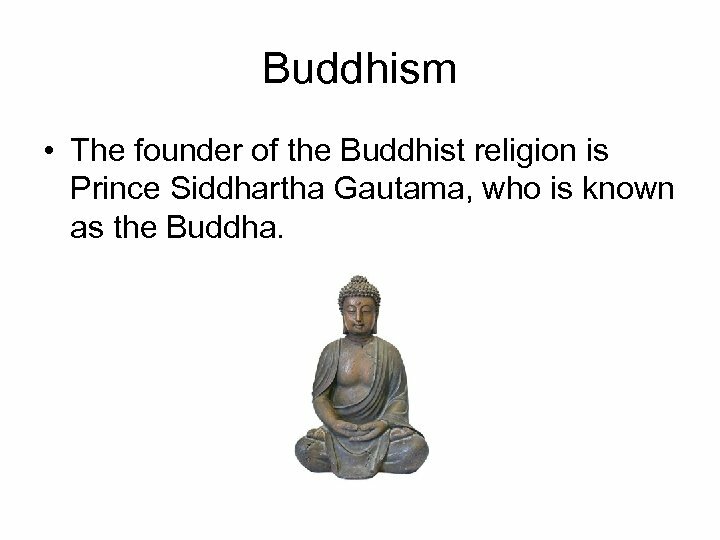 Buddhism • The founder of the Buddhist religion is Prince Siddhartha Gautama, who is known as the Buddha. 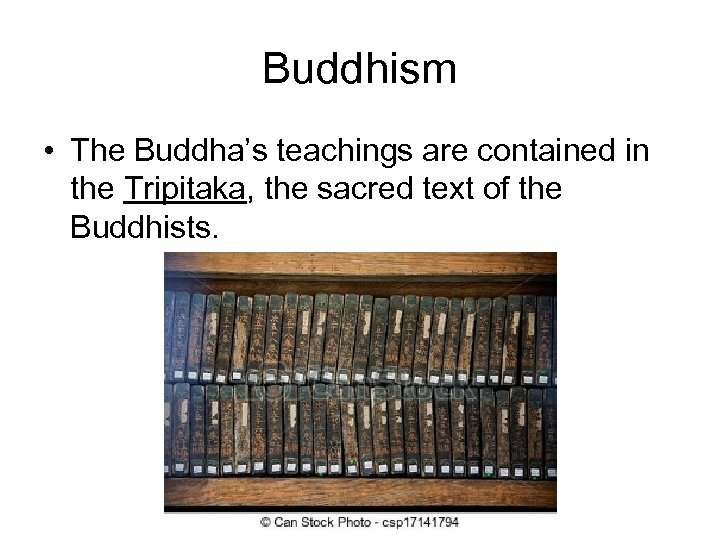 Buddhism • The Buddha’s teachings are contained in the Tripitaka, the sacred text of the Buddhists. 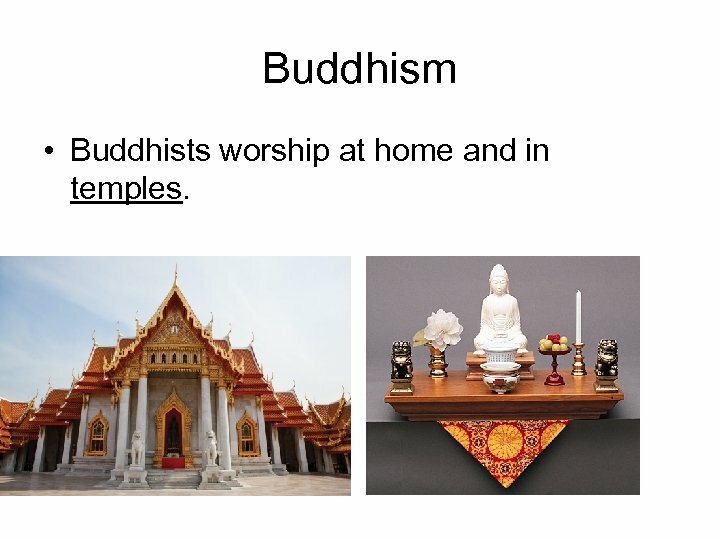 Buddhism • Buddhists worship at home and in temples. 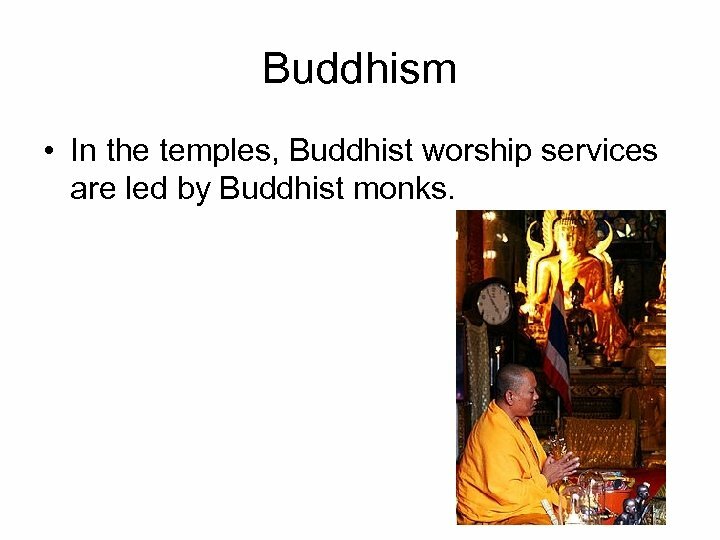 Buddhism • In the temples, Buddhist worship services are led by Buddhist monks. 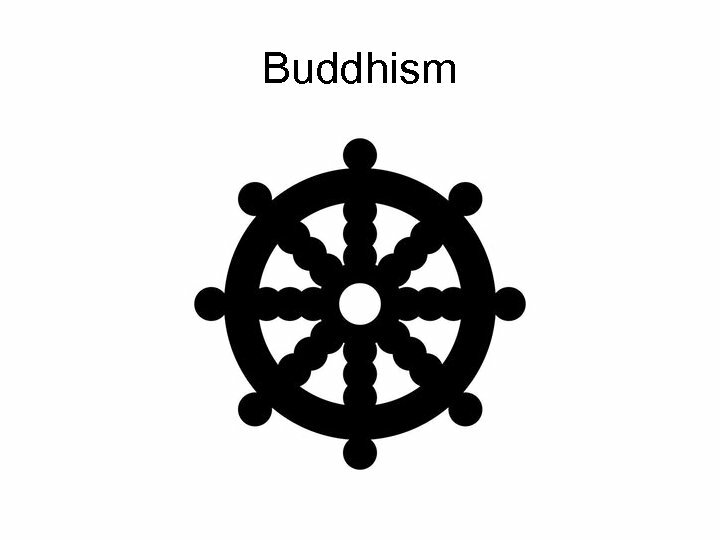 Buddhism • The main goal of Buddhism is to break the cycle of reincarnation through enlightenment, in which a person ceases to be selfish and fond of worldly things an achieves nirvana. 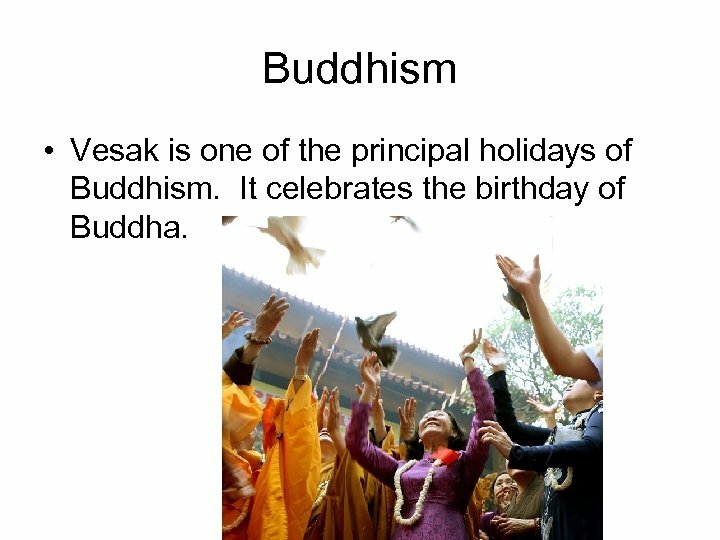 Buddhism • Vesak is one of the principal holidays of Buddhism. 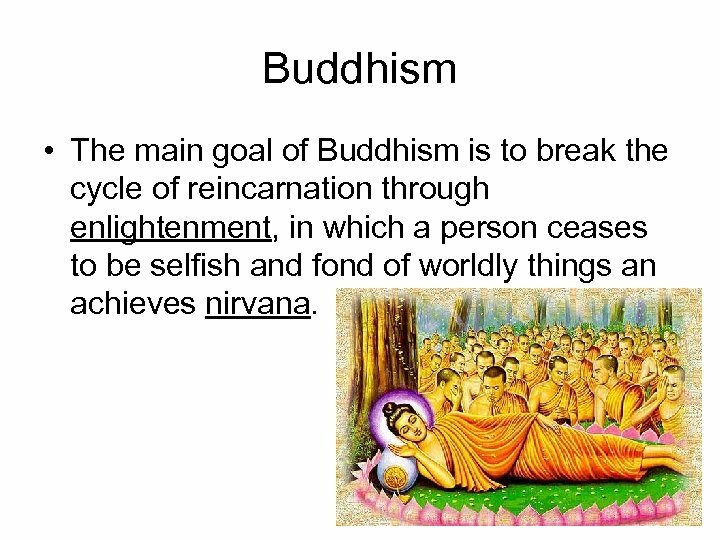 It celebrates the birthday of Buddha. 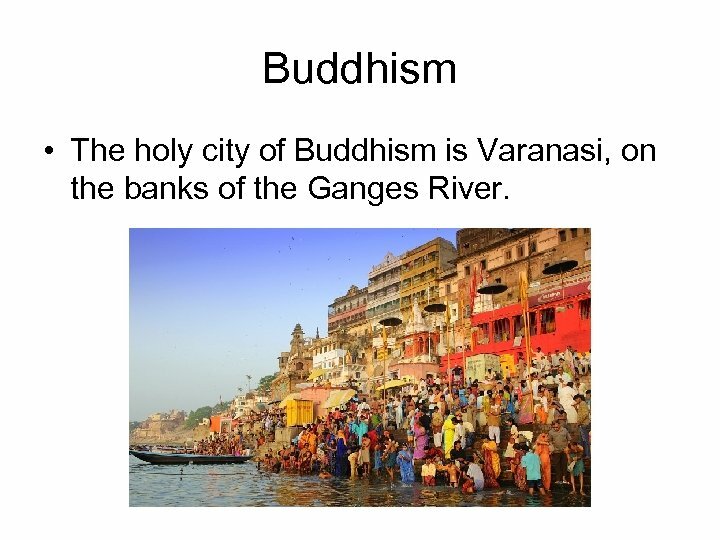 Buddhism • The holy city of Buddhism is Varanasi, on the banks of the Ganges River.